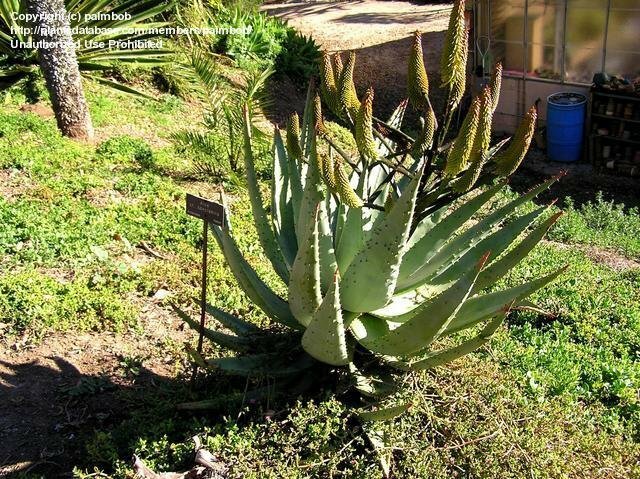 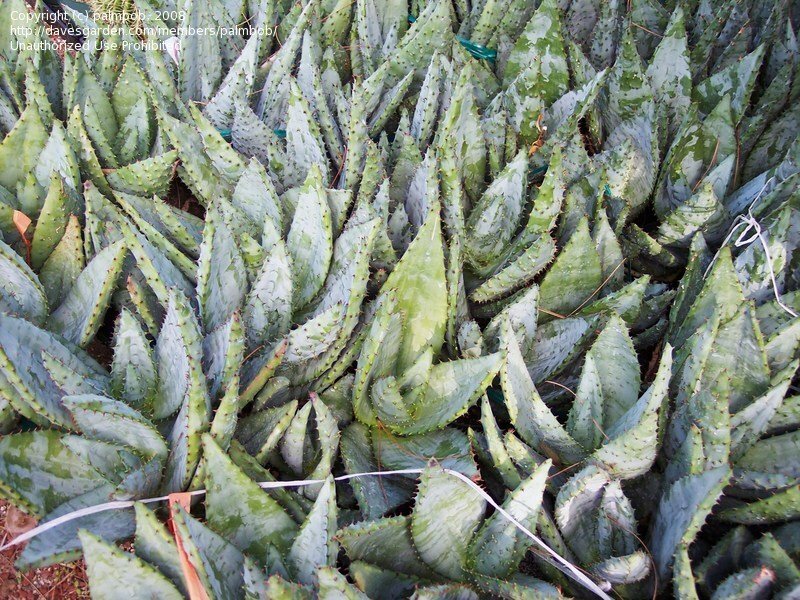 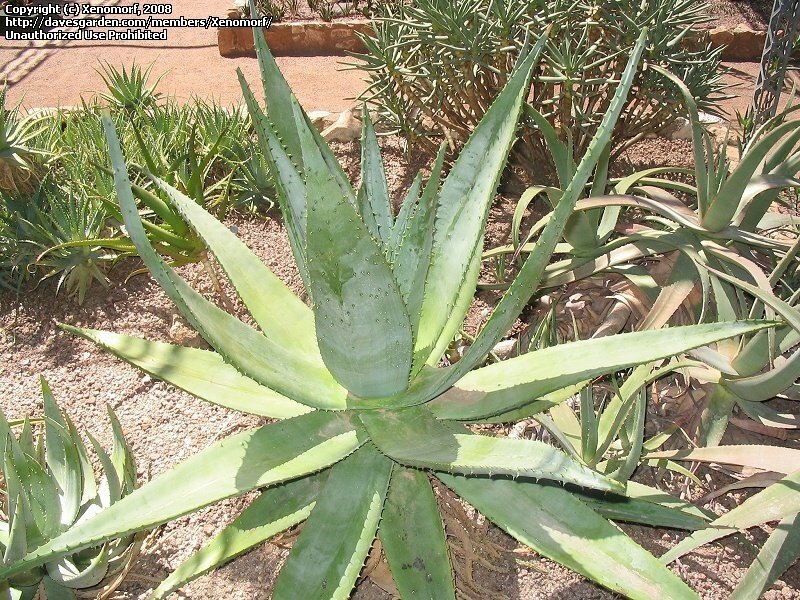 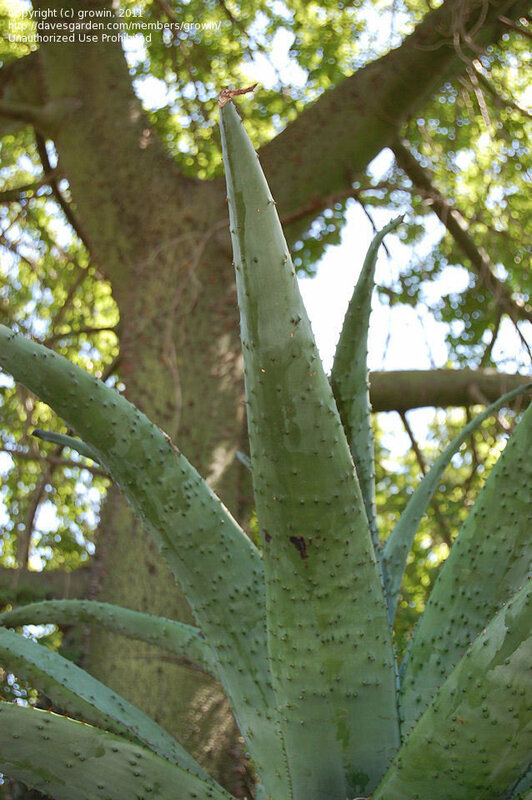 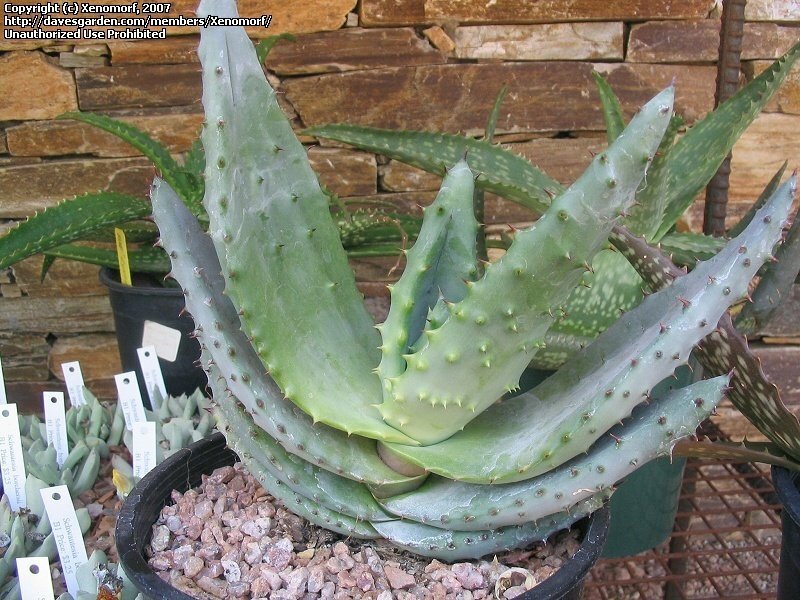 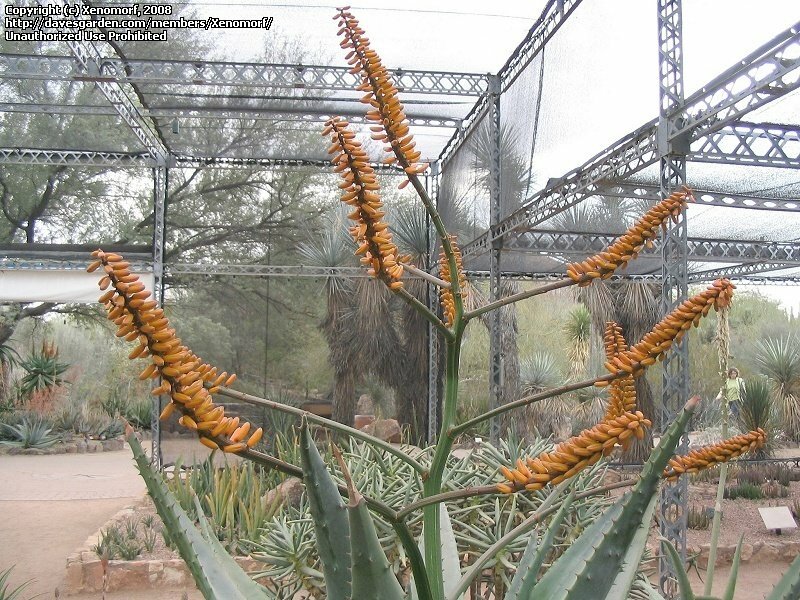 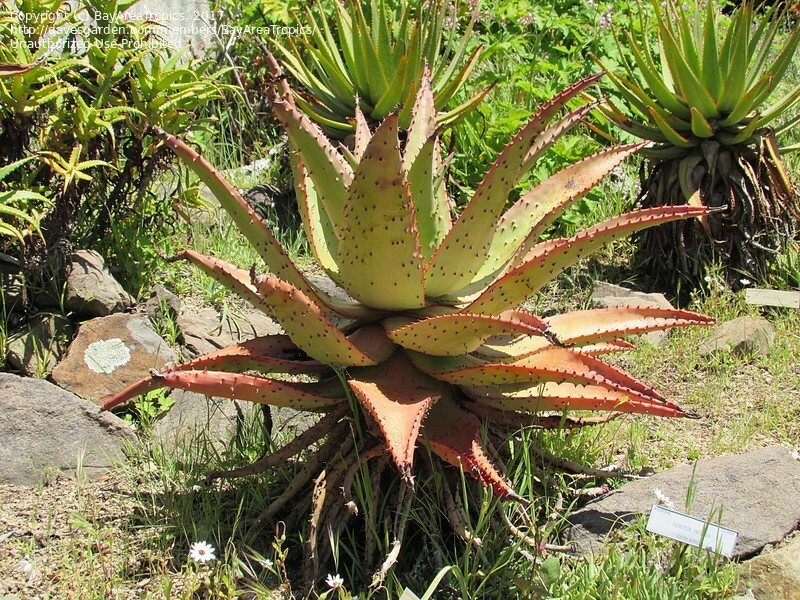 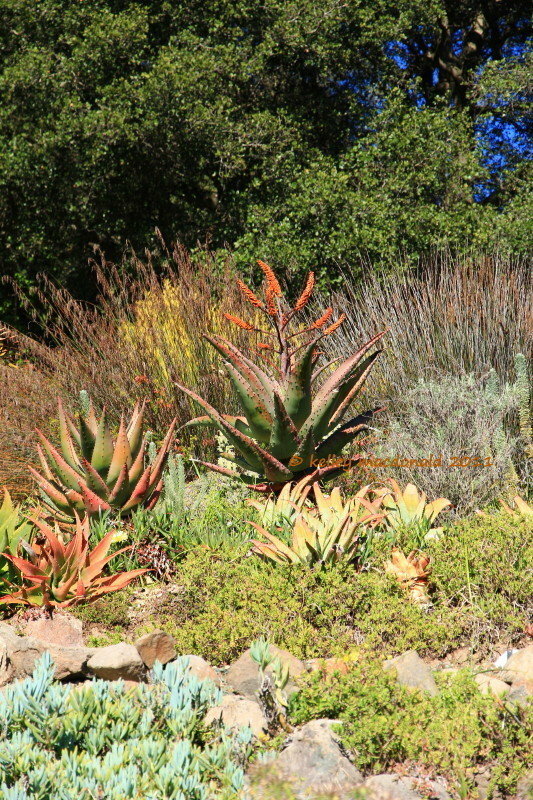 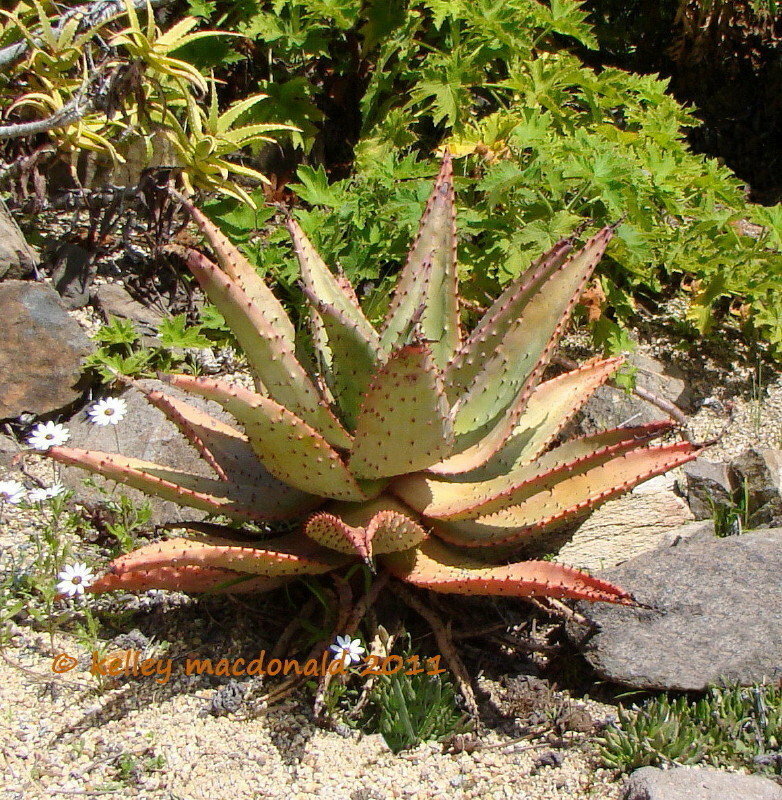 Here are some Aloes labeled as A marlothii in a reputable botanical garden that do NOT show the typical spiny leaves... probably hybrids? 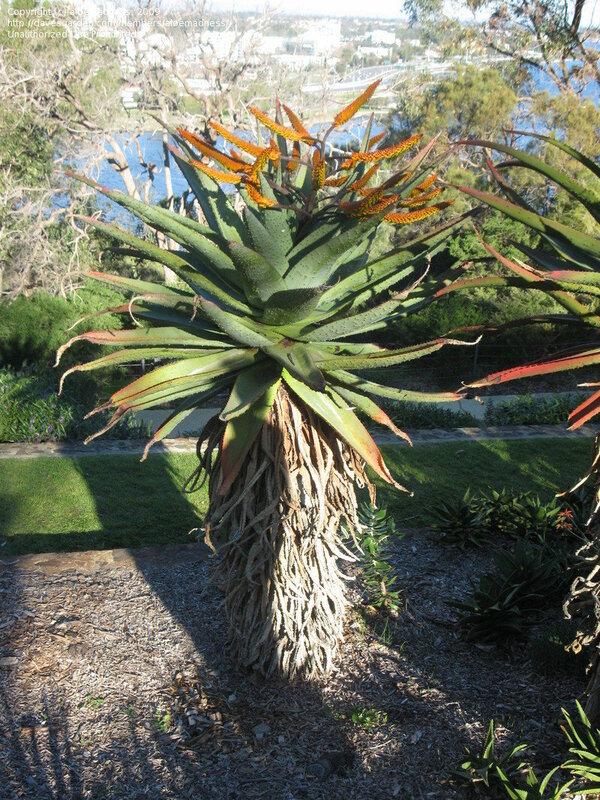 January plant in Pasadena showing one 'typical' flower pattern and color. 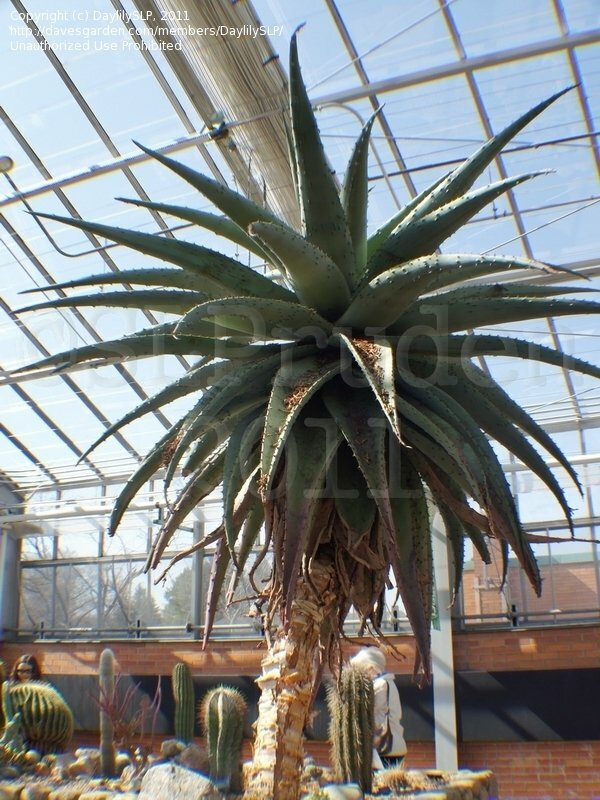 Is this the real one? 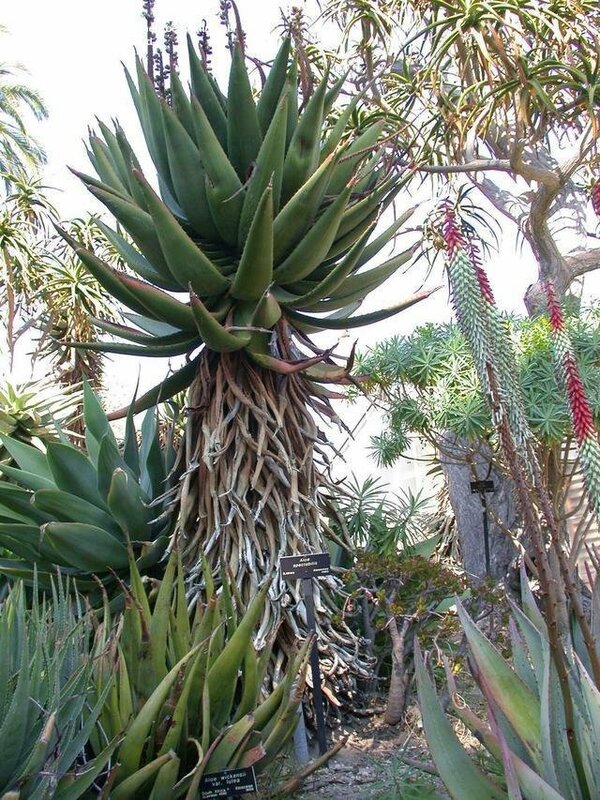 Tall, impressive. 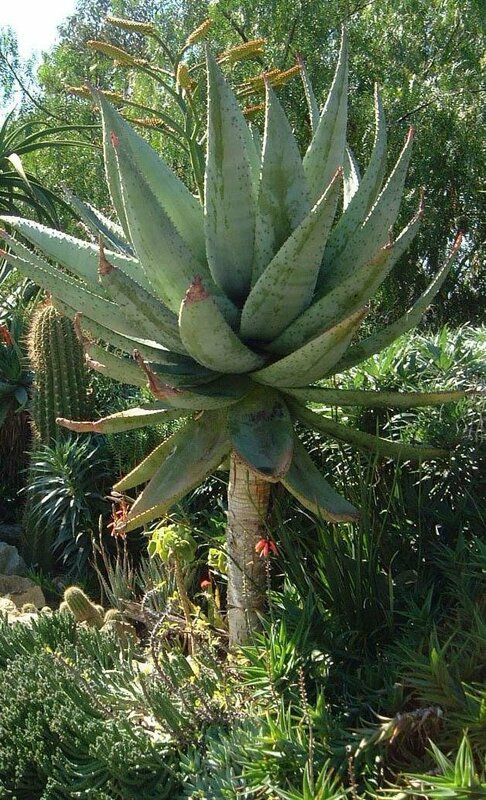 This one is a baby at six feet. 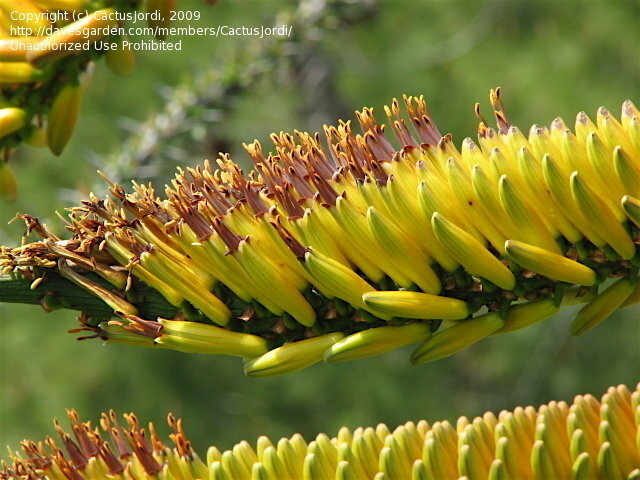 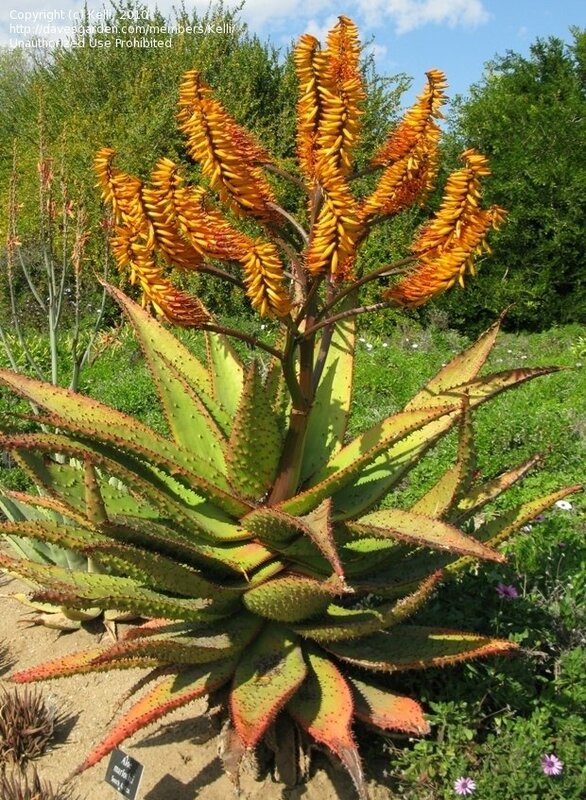 Much like Aloe marlothii except for the 'toothbrush' effect of the blooms on the spike. 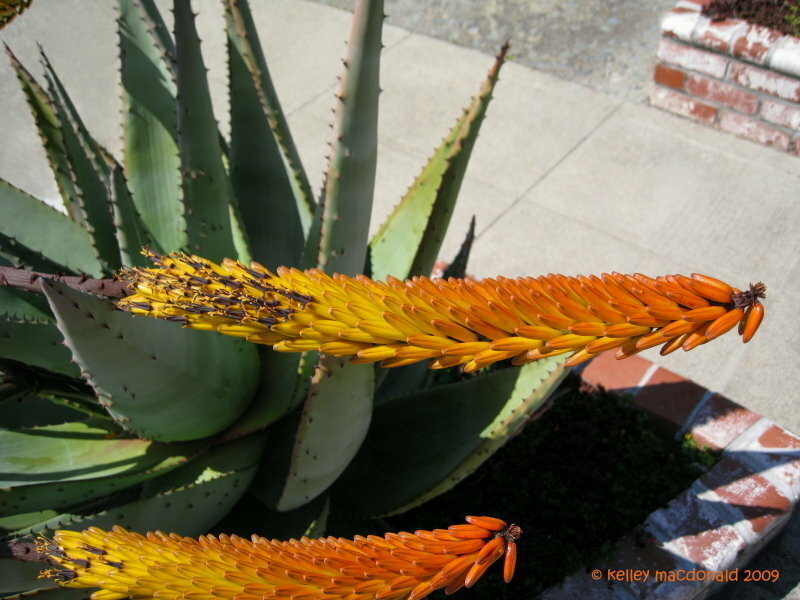 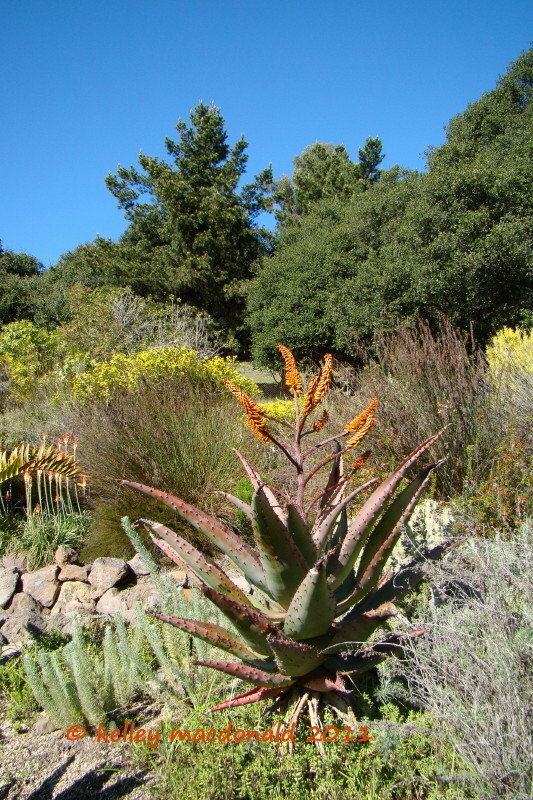 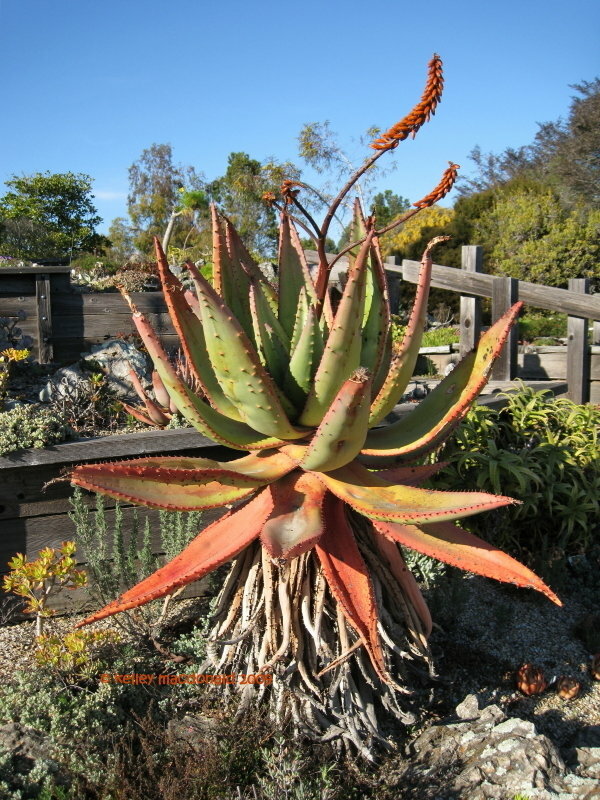 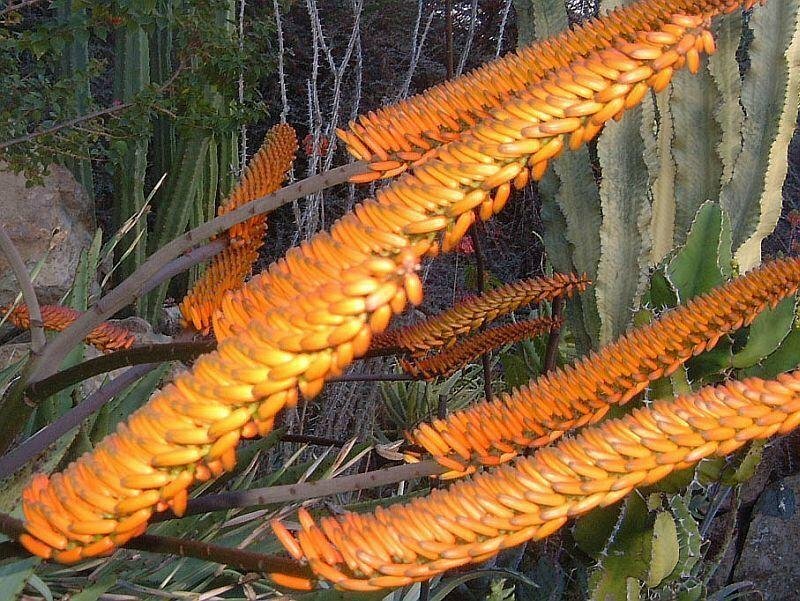 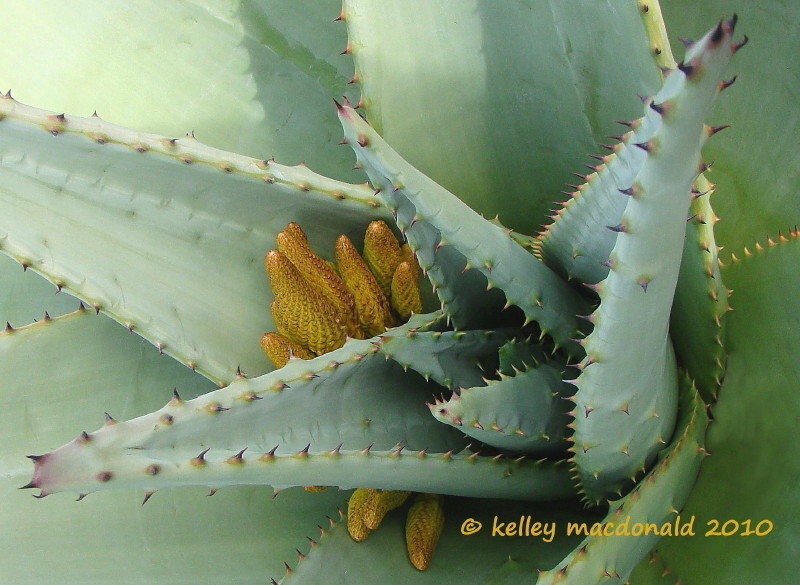 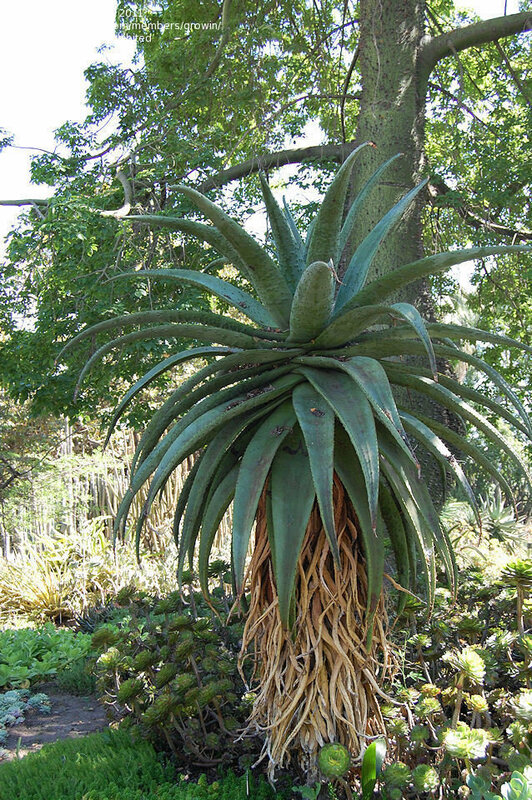 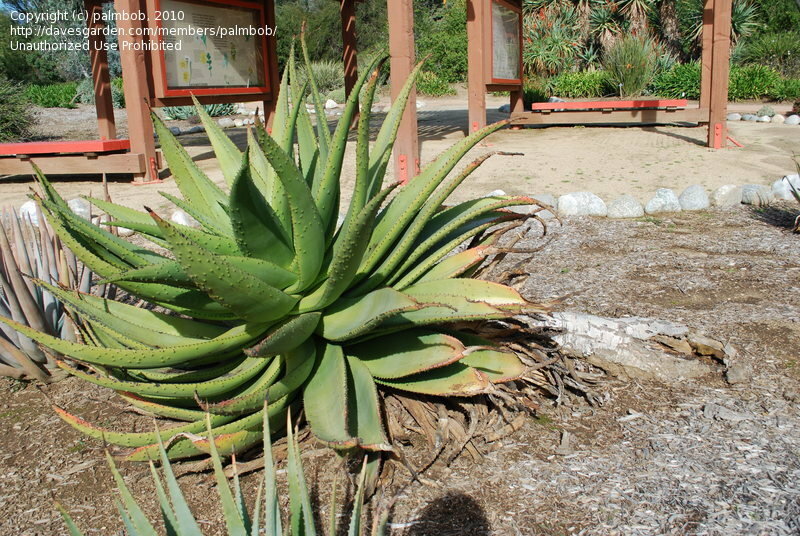 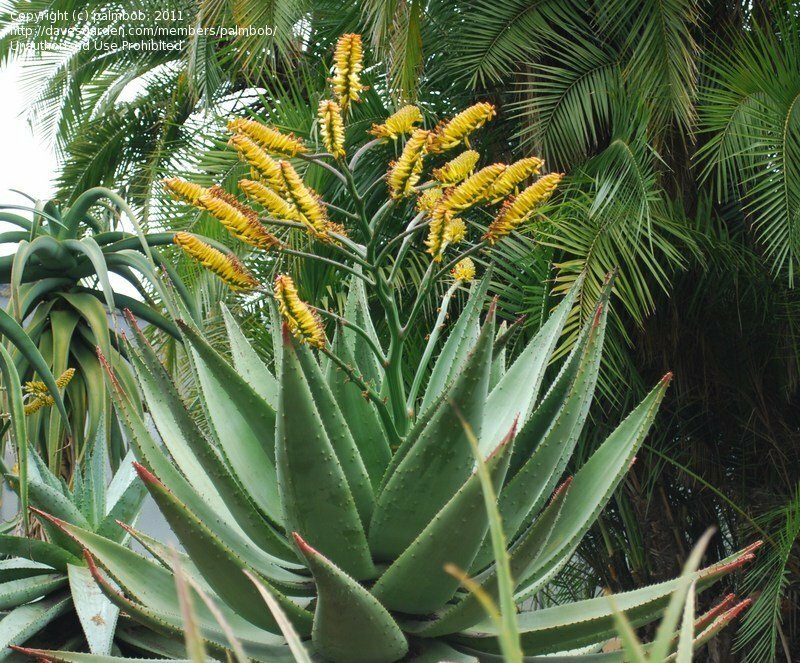 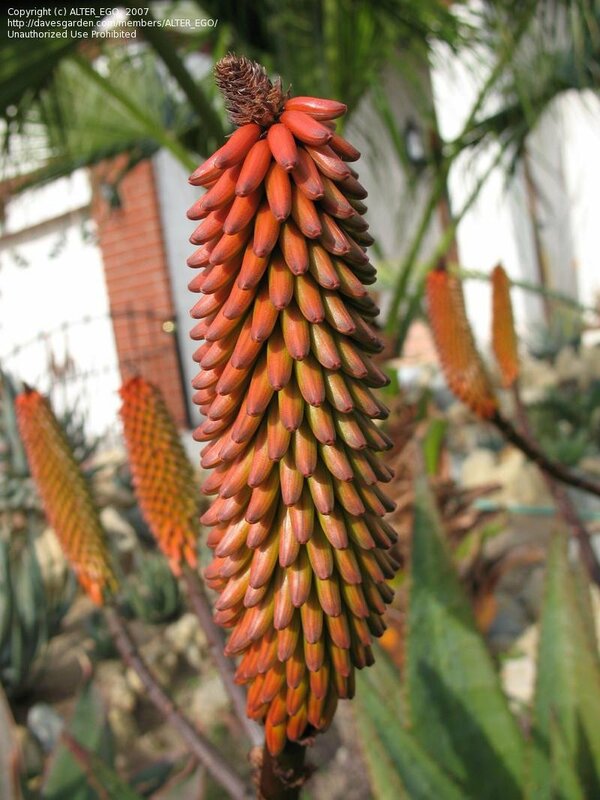 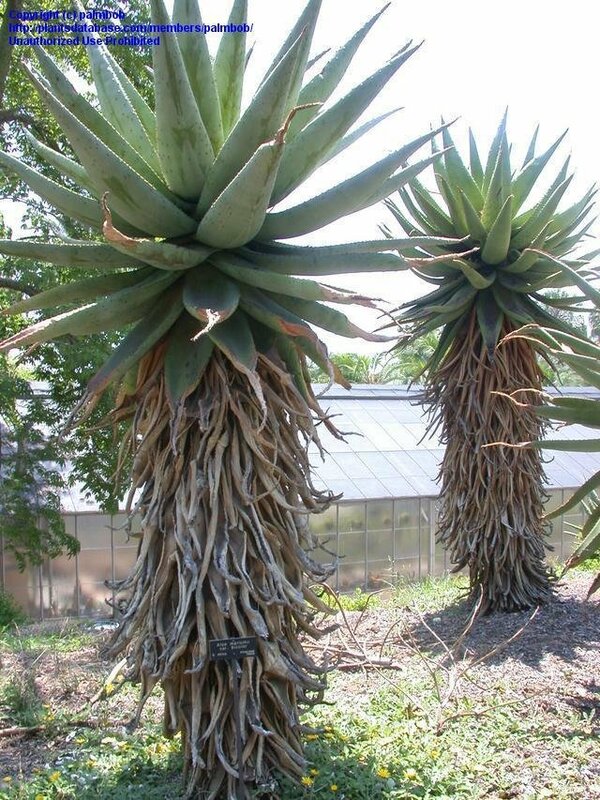 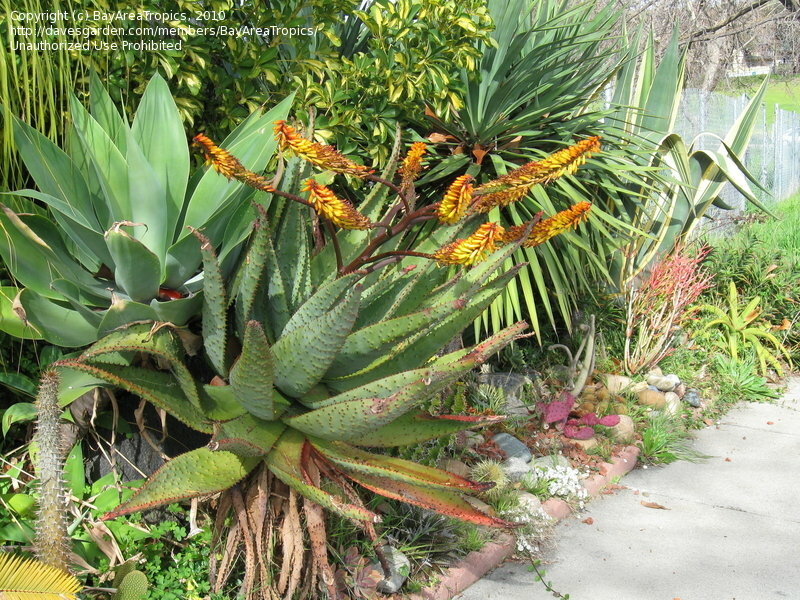 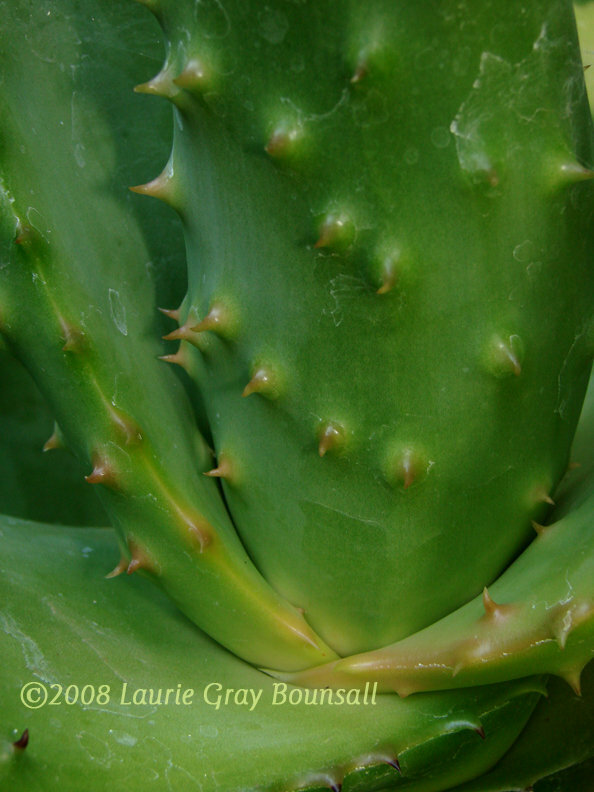 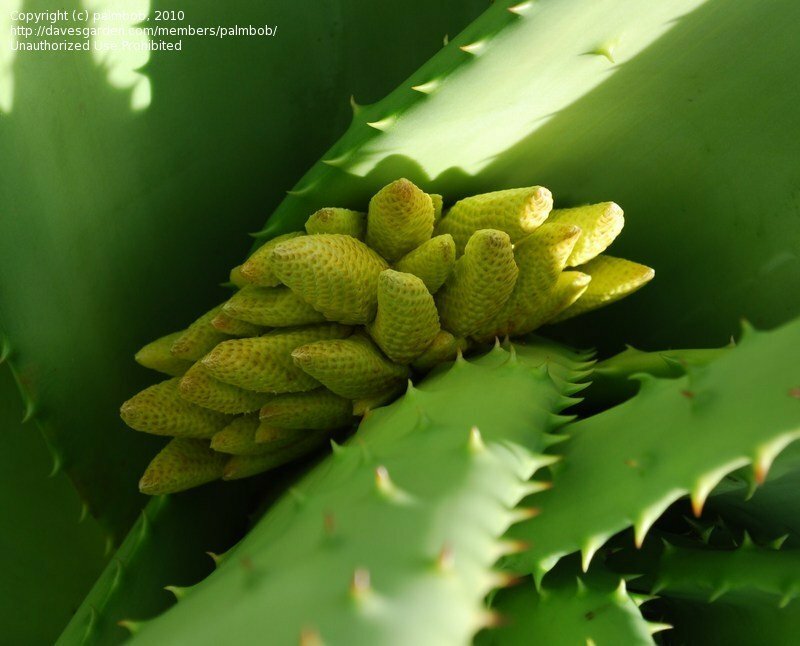 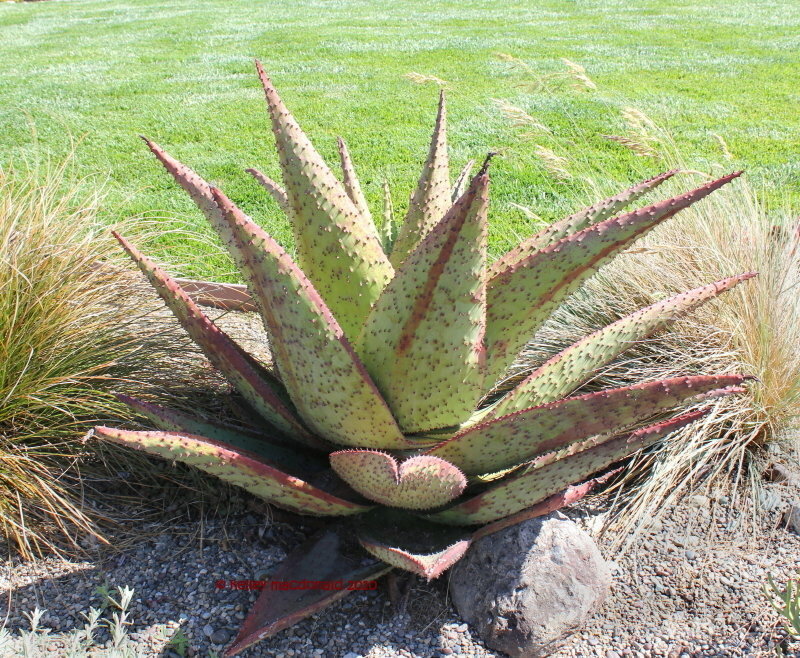 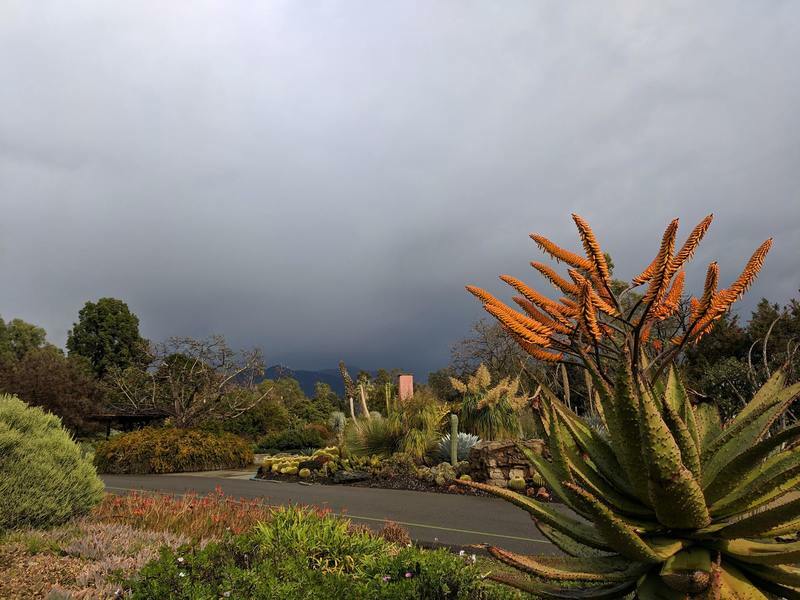 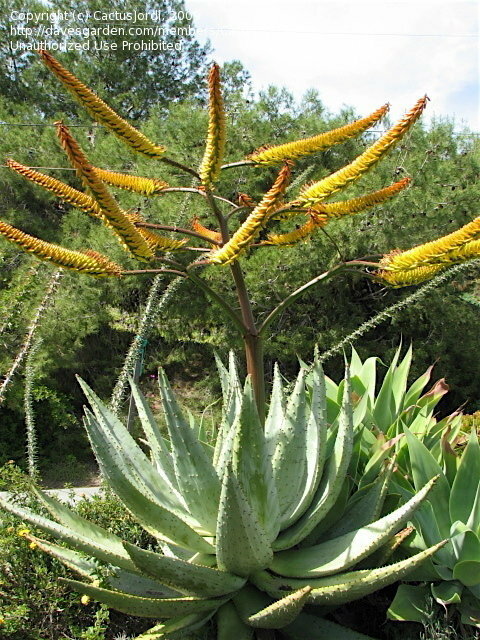 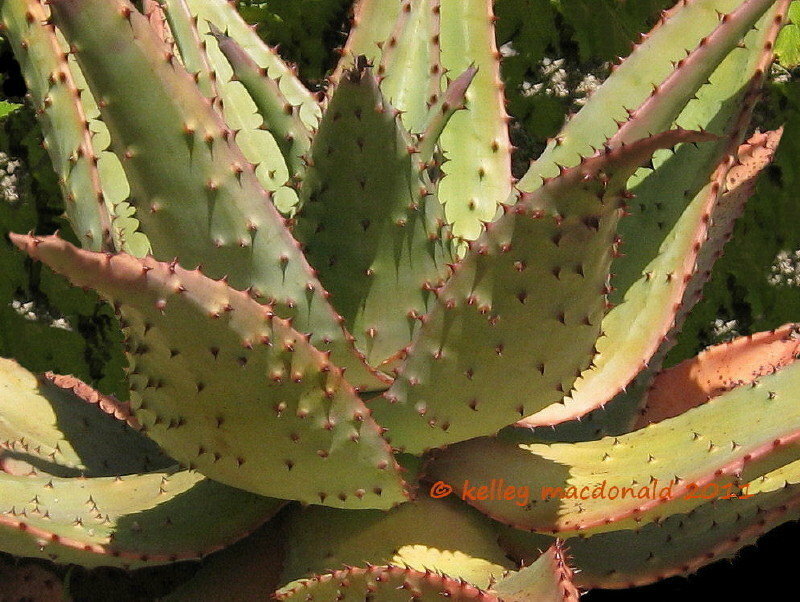 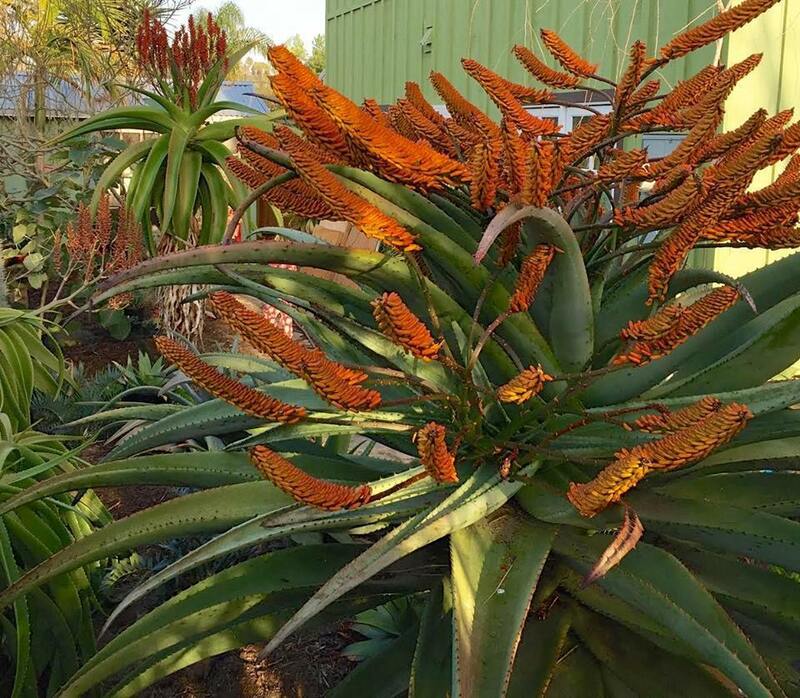 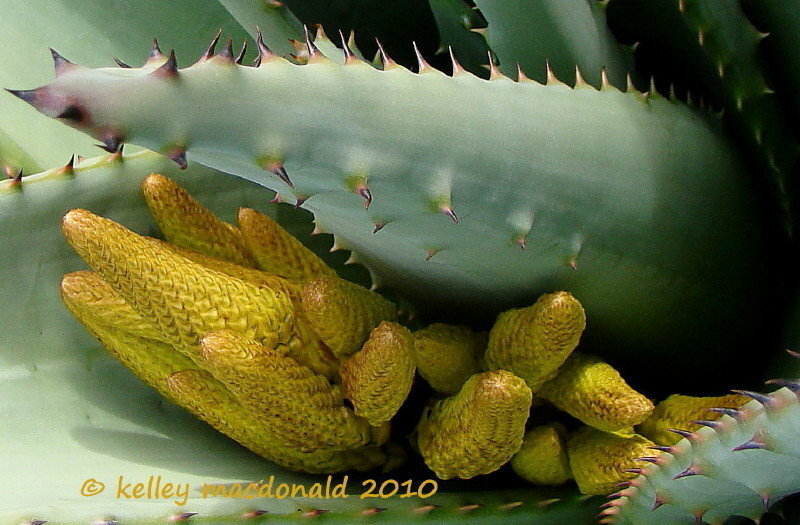 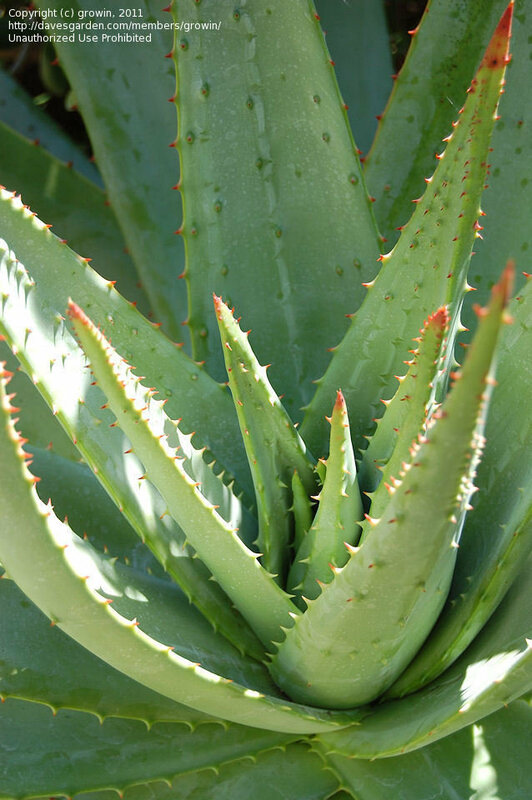 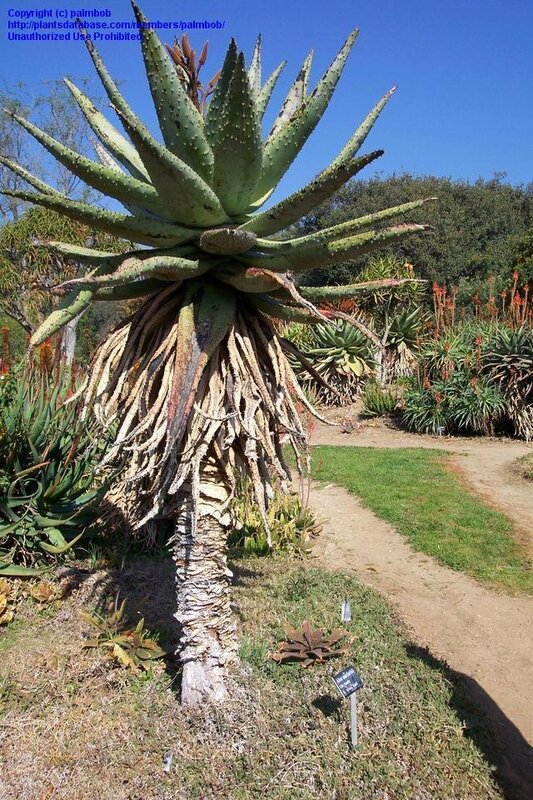 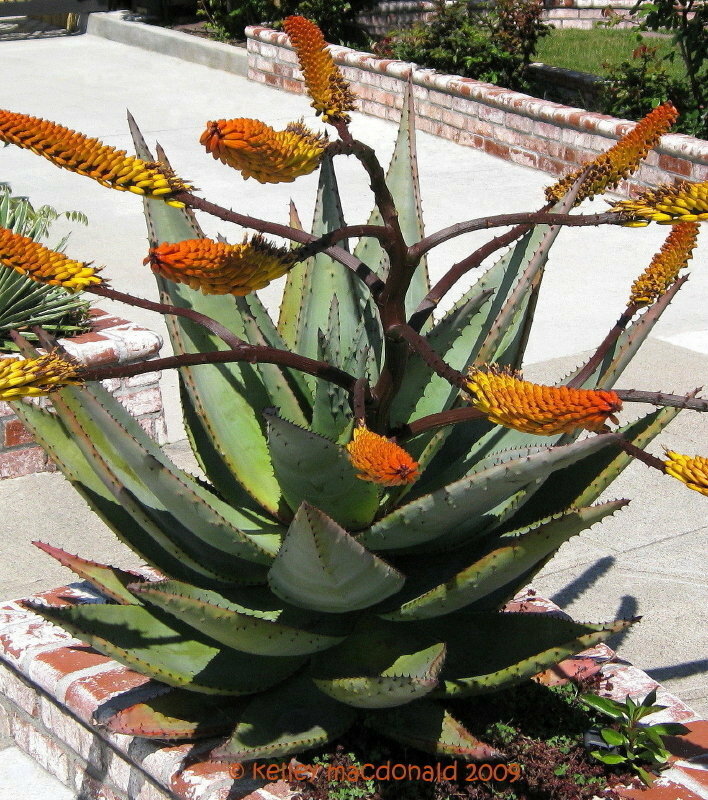 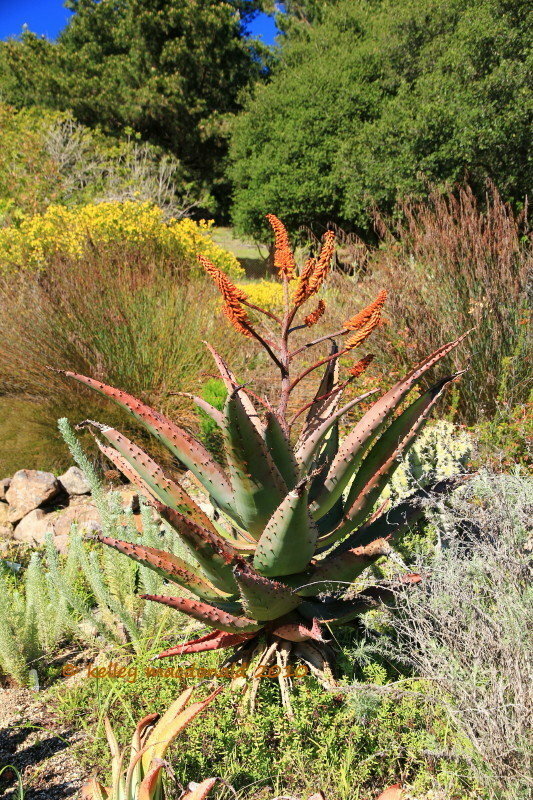 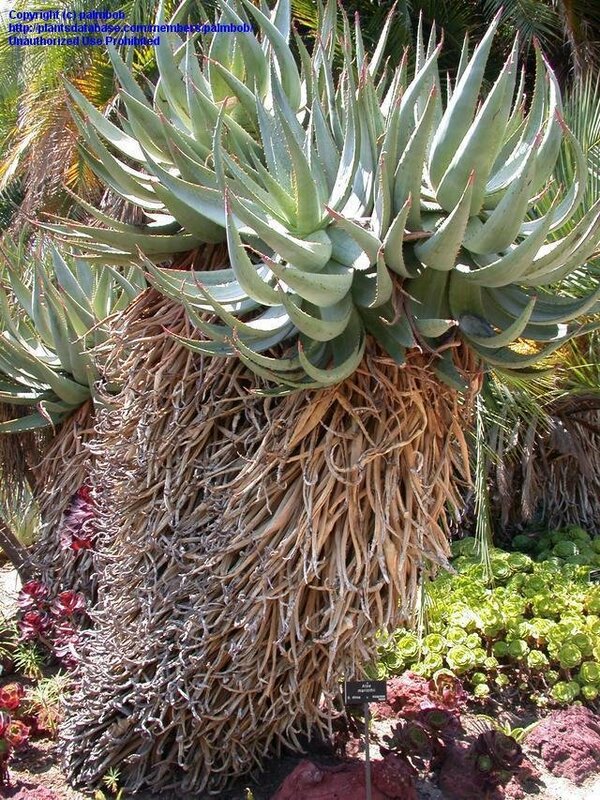 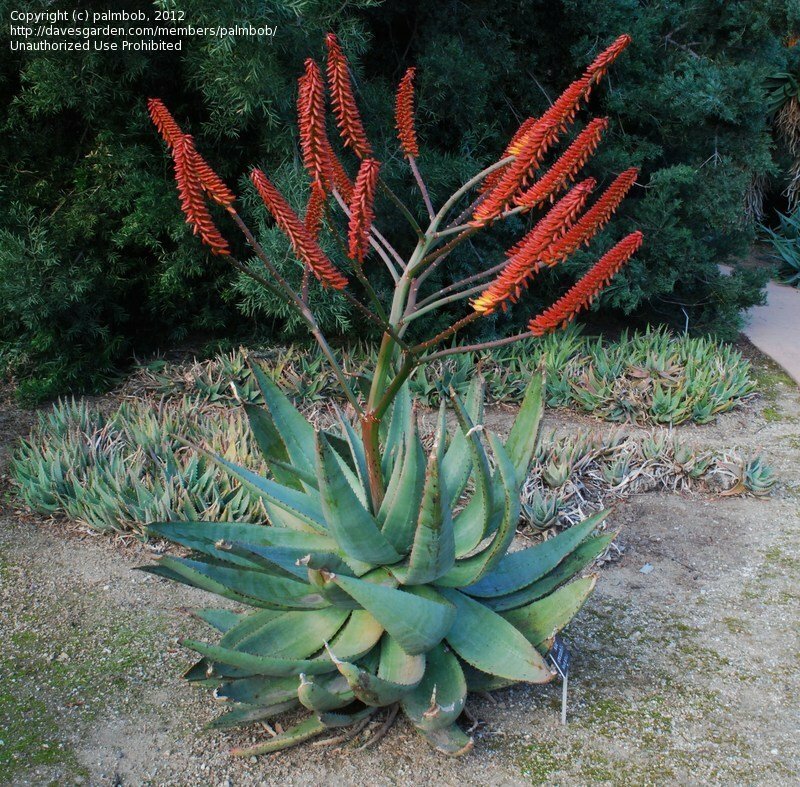 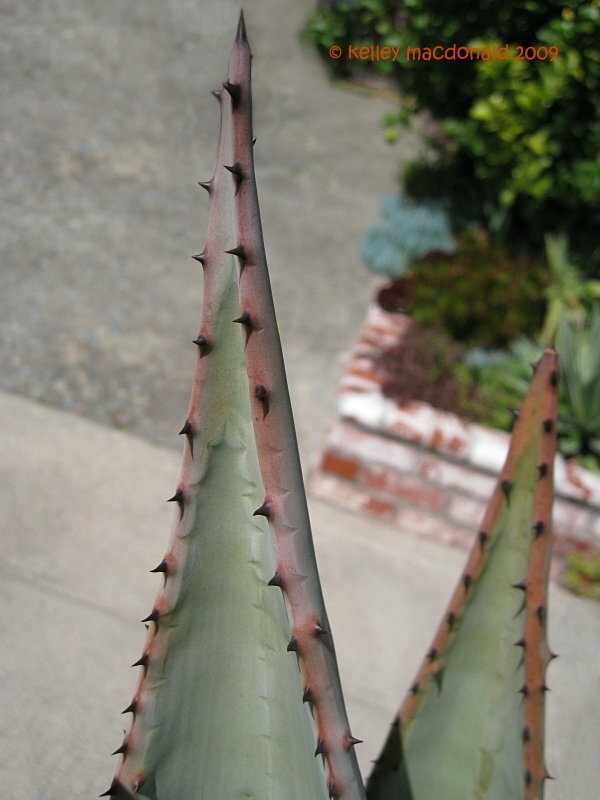 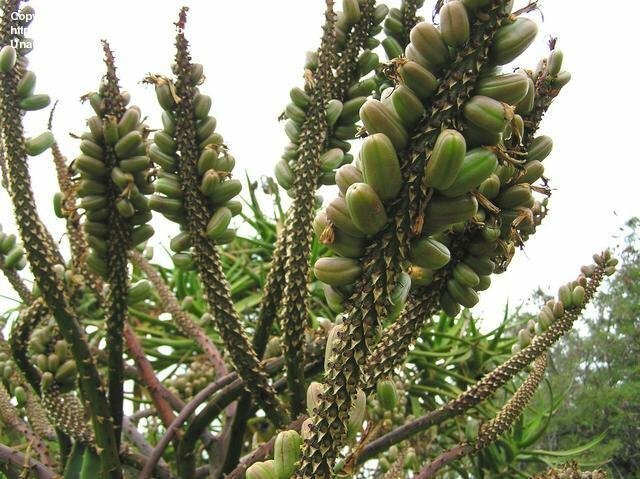 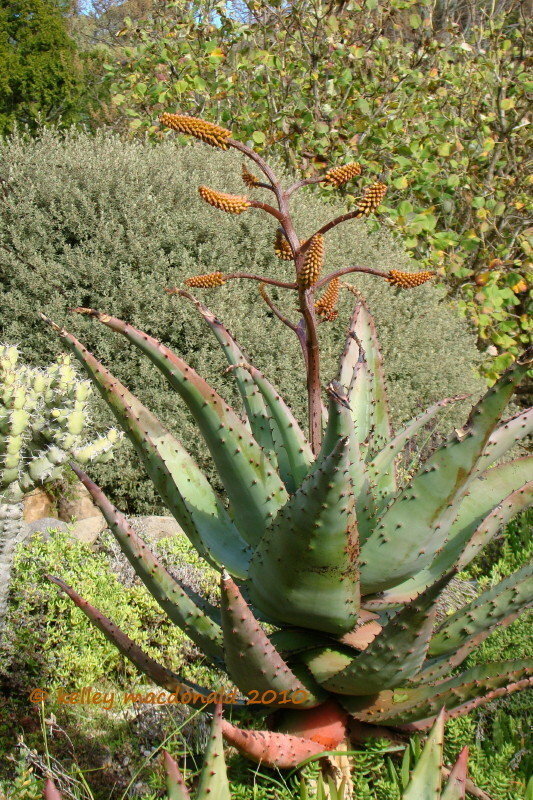 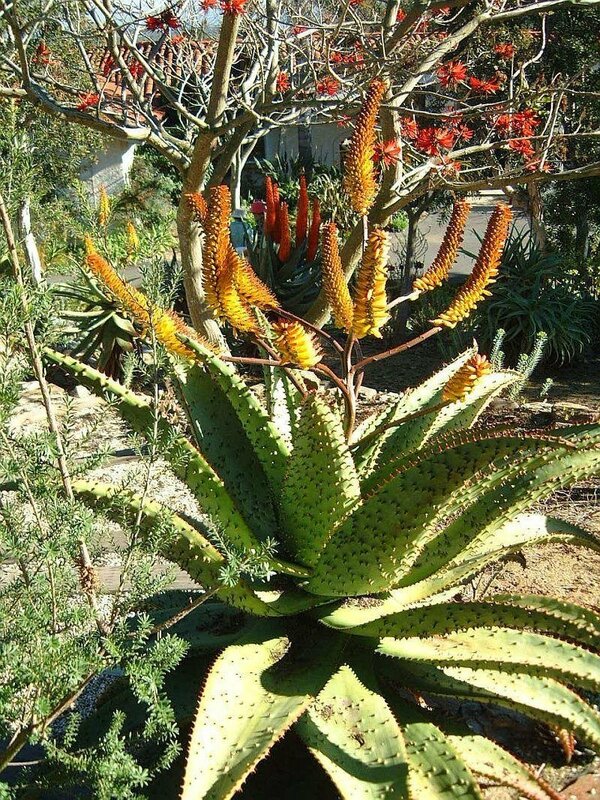 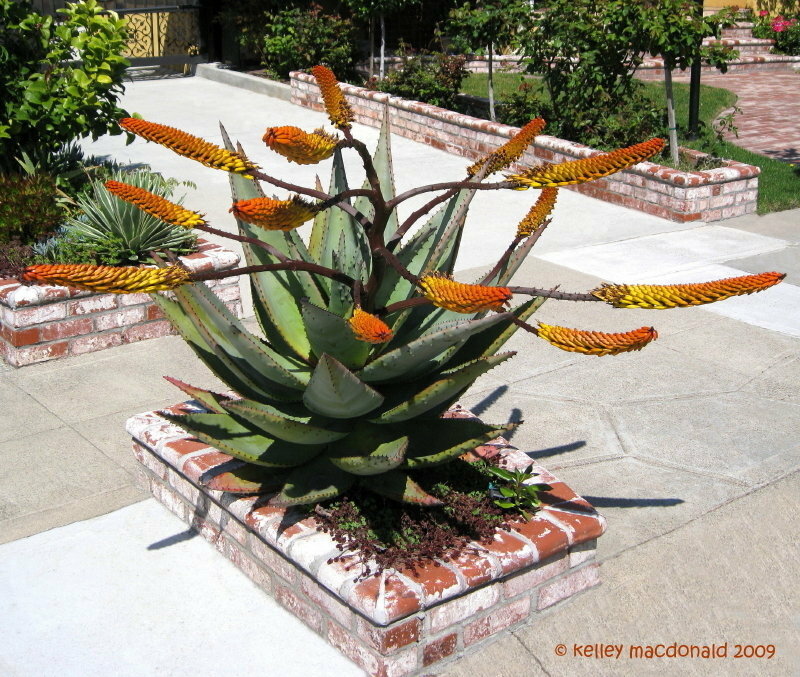 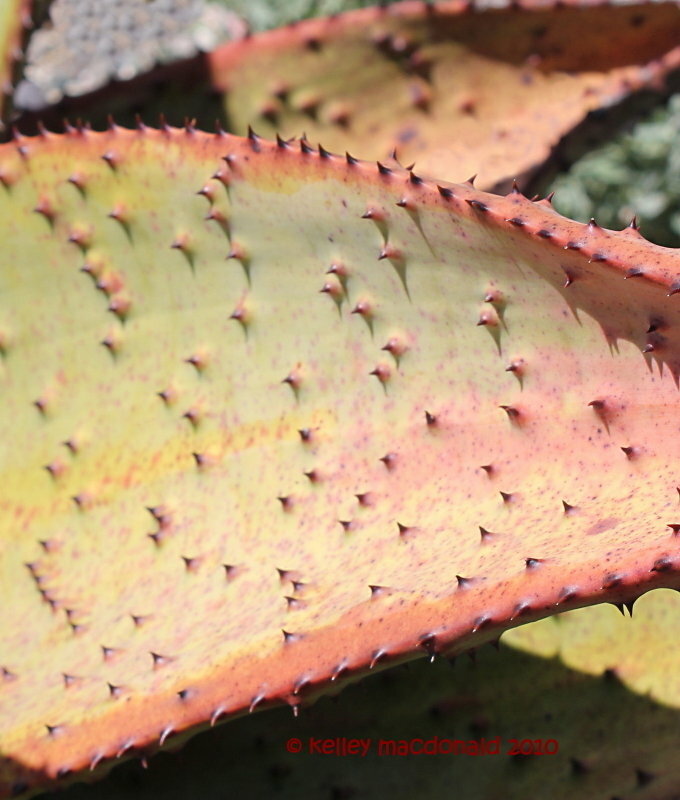 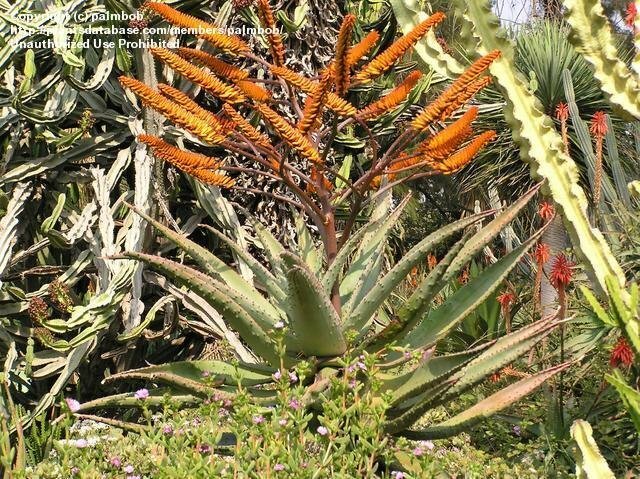 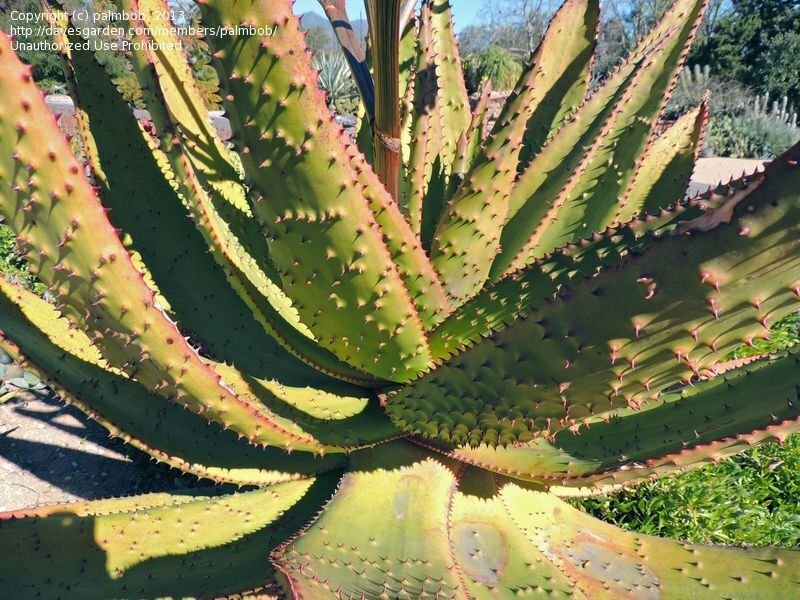 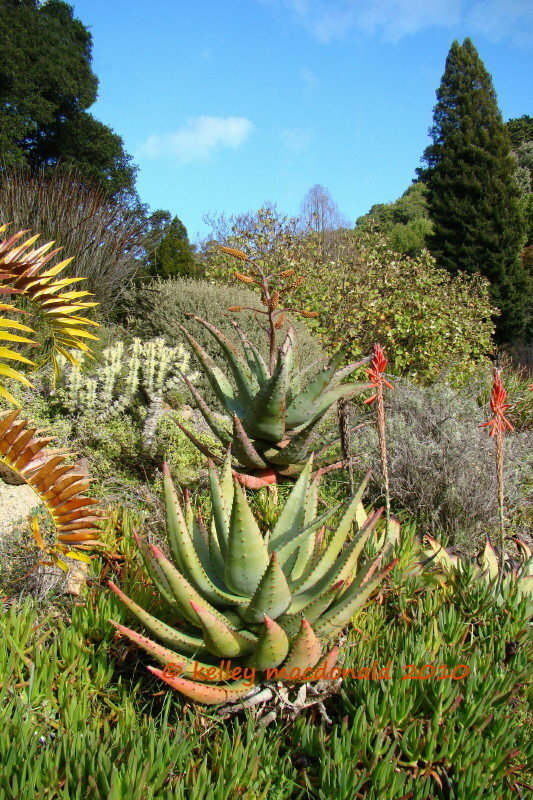 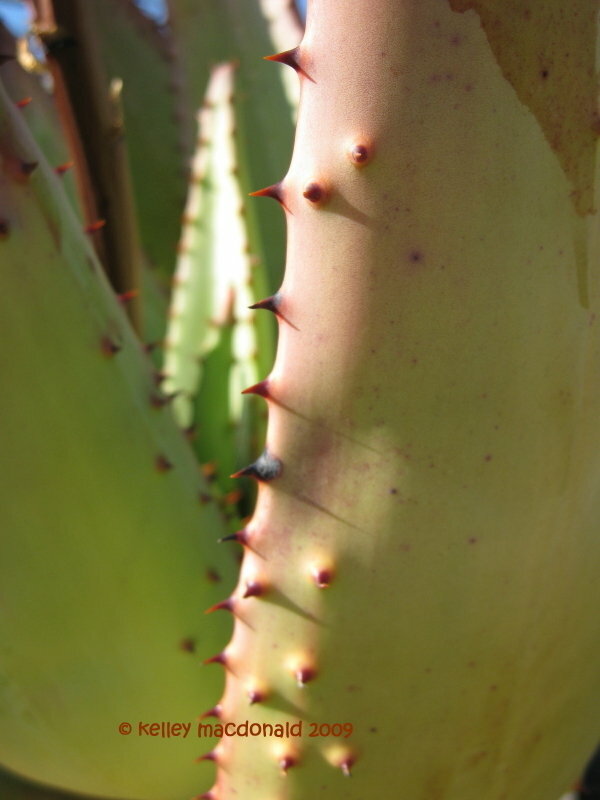 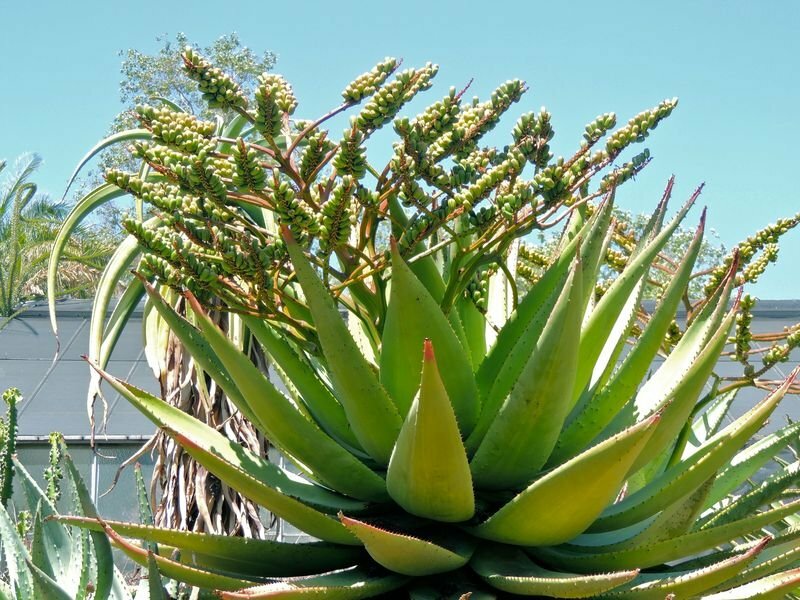 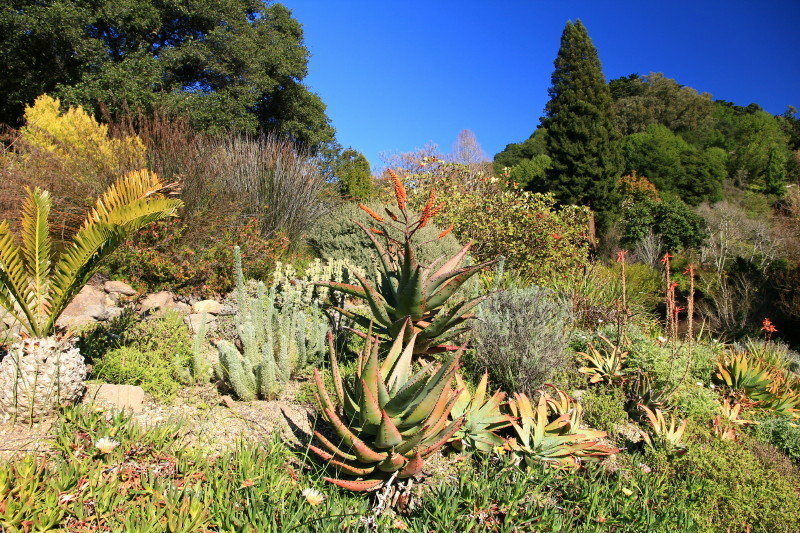 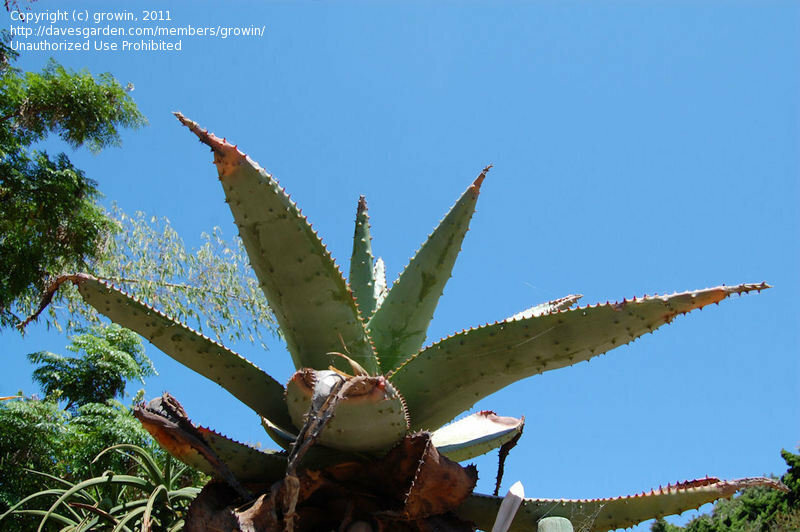 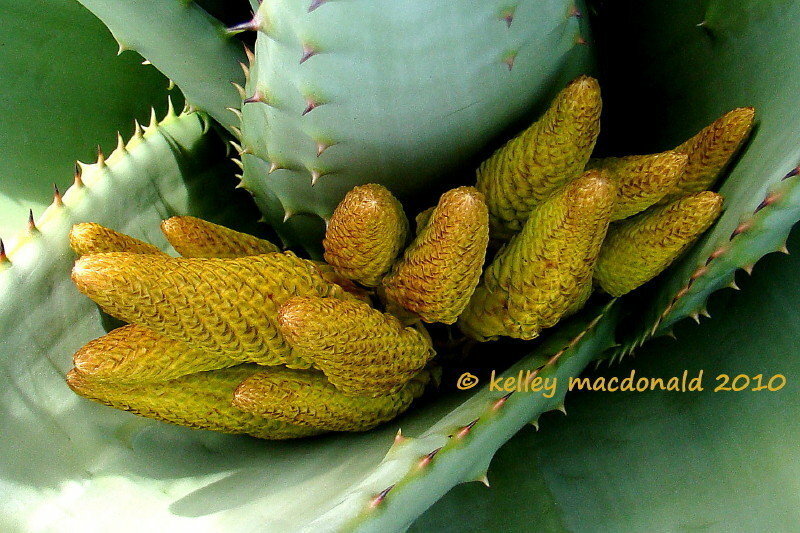 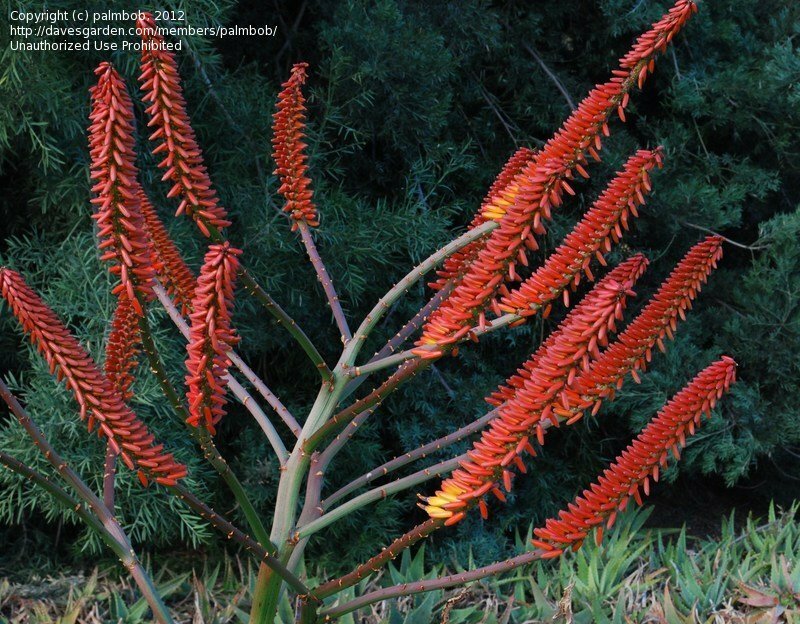 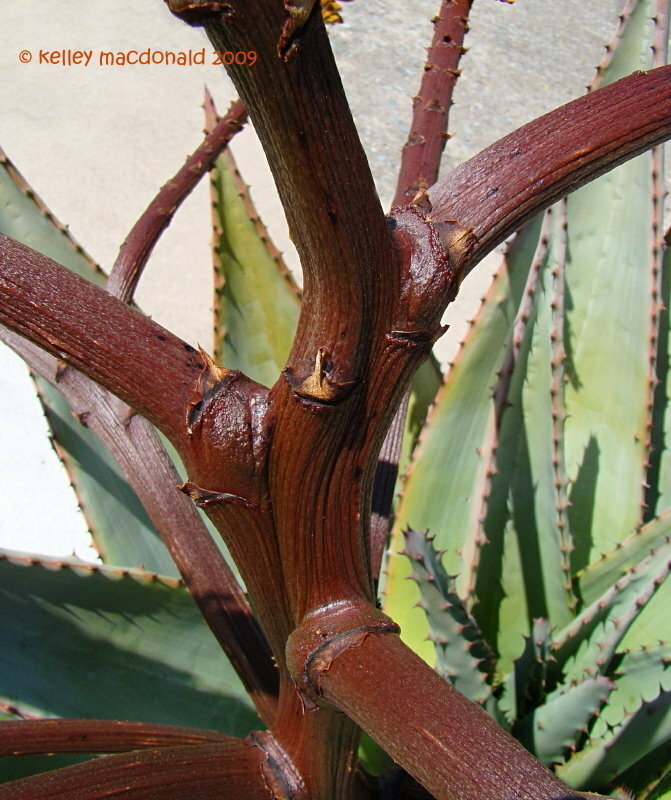 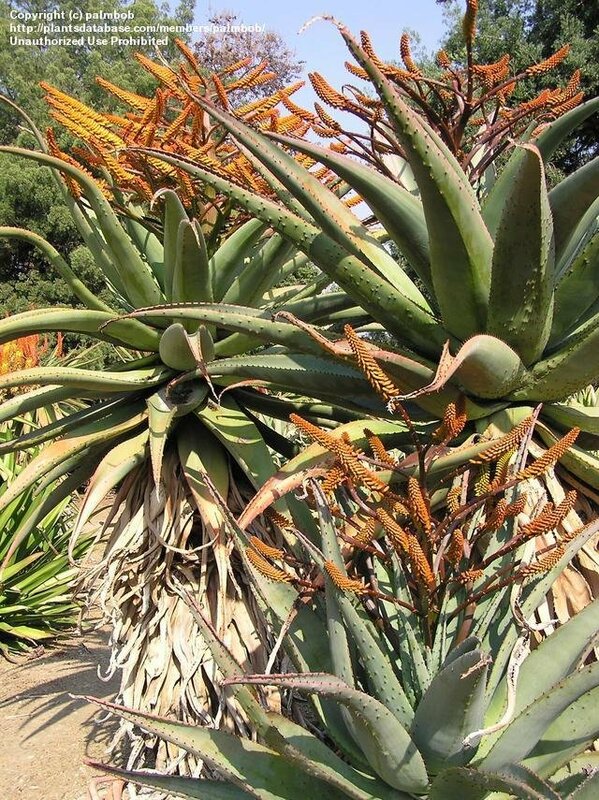 The KwaZulu form of Aloe marlothii, what used to be called Aloe spectabilis, at the Huntington Gardens, California, January. 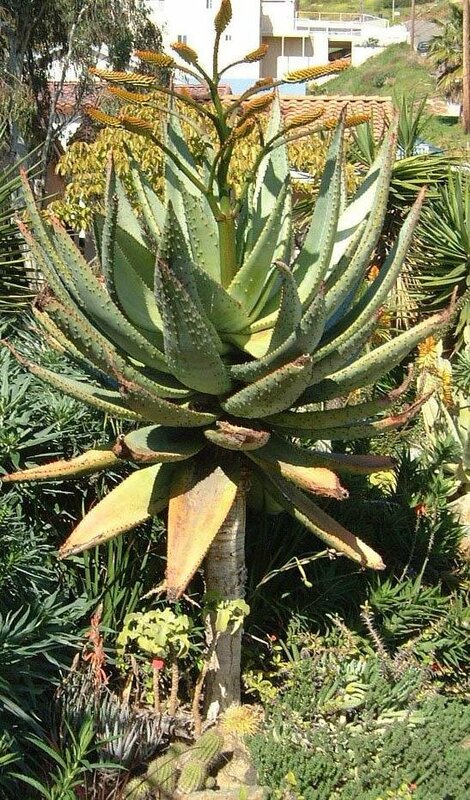 Grows here with some protection. 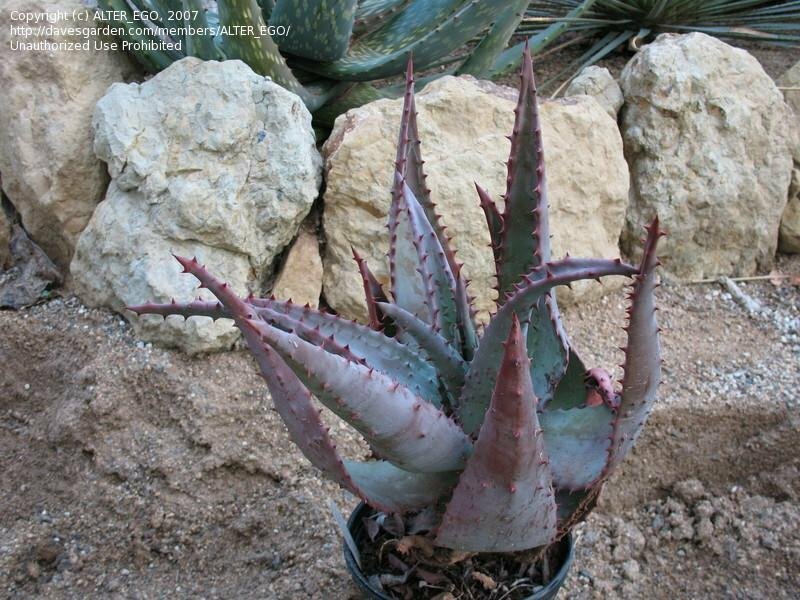 I think, this is the real one. 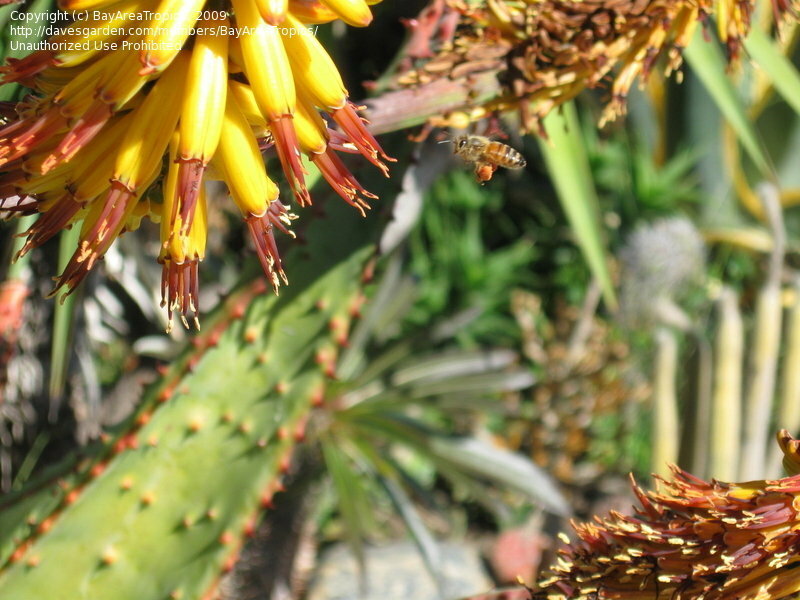 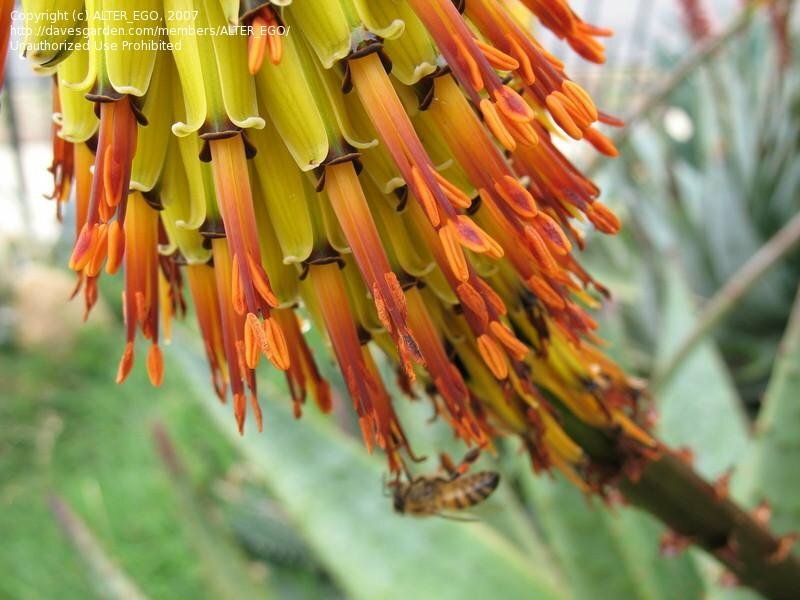 Happy bee with Aloe marlothii pollen. 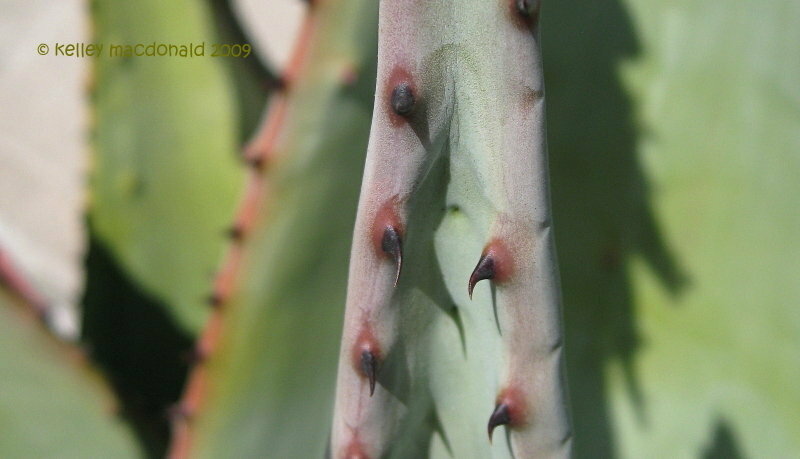 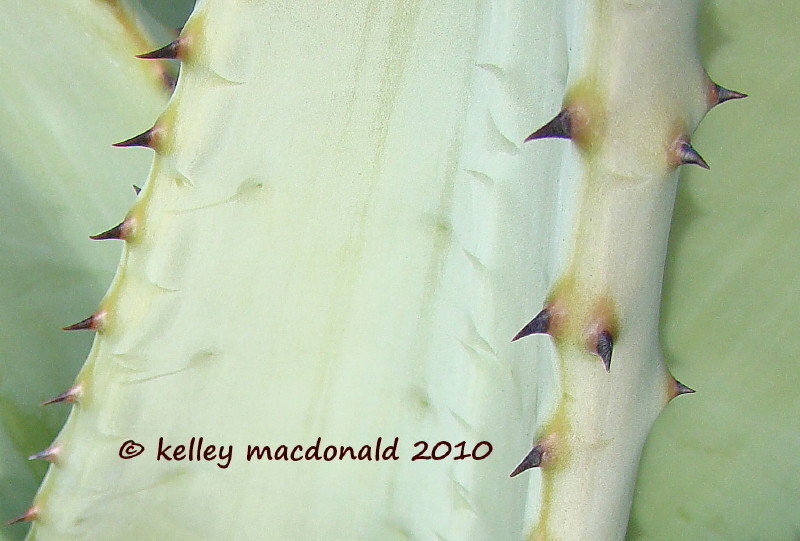 Flower stalk color matches the rim of the leaves and thorns. 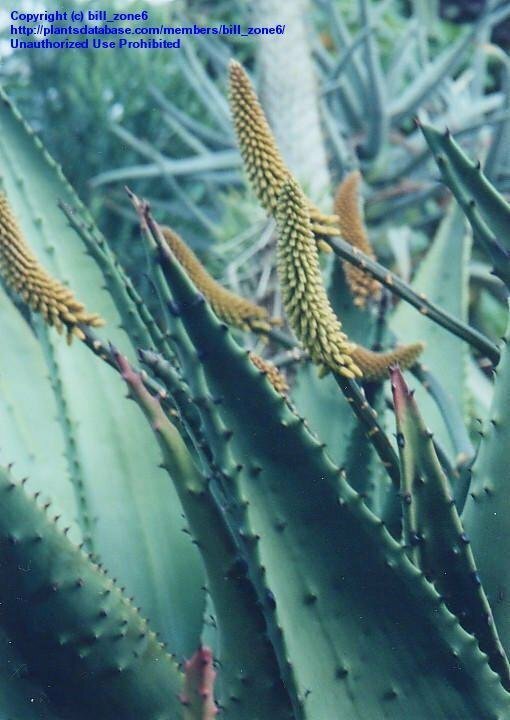 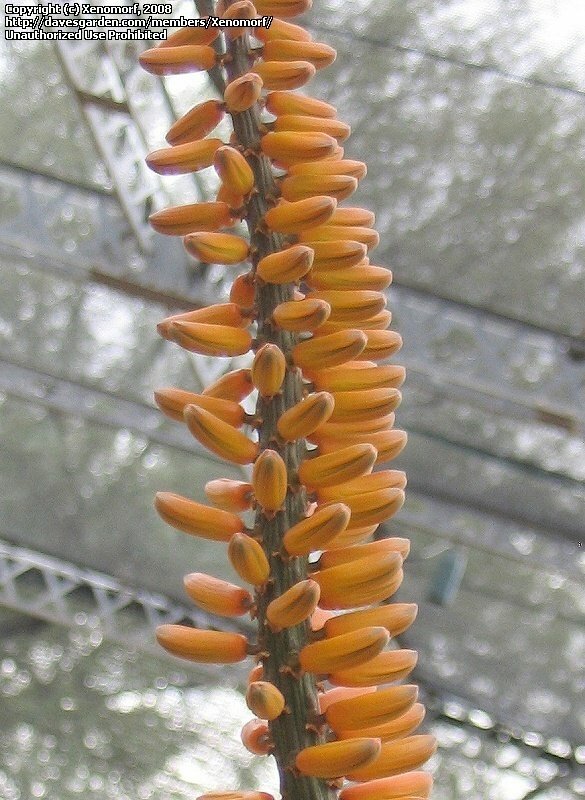 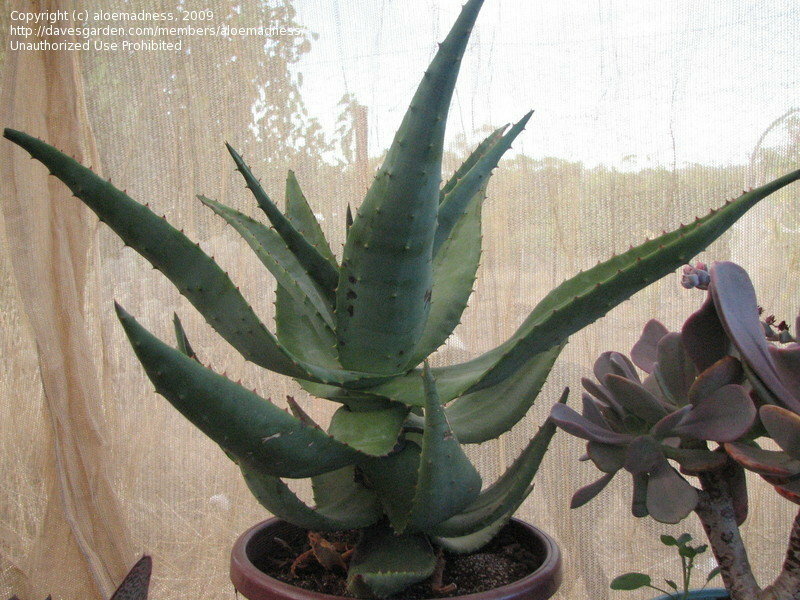 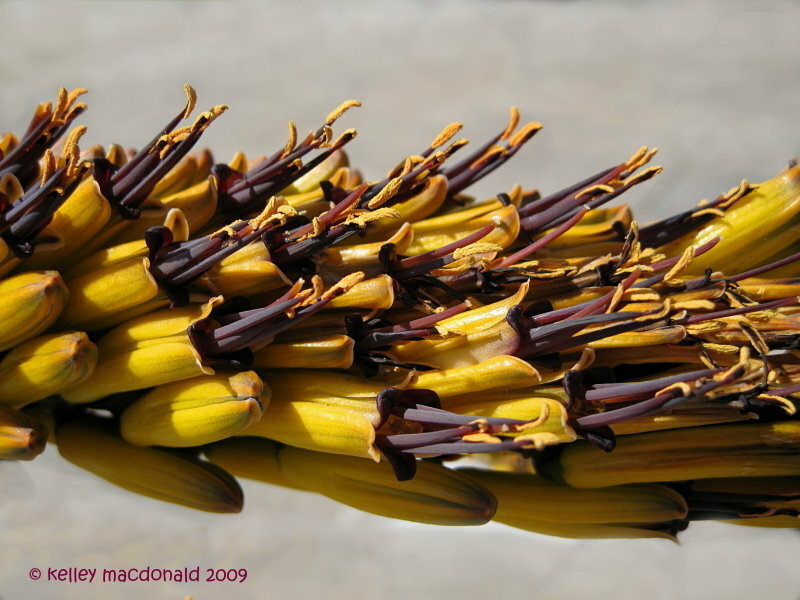 Young Aloe Marlothii. 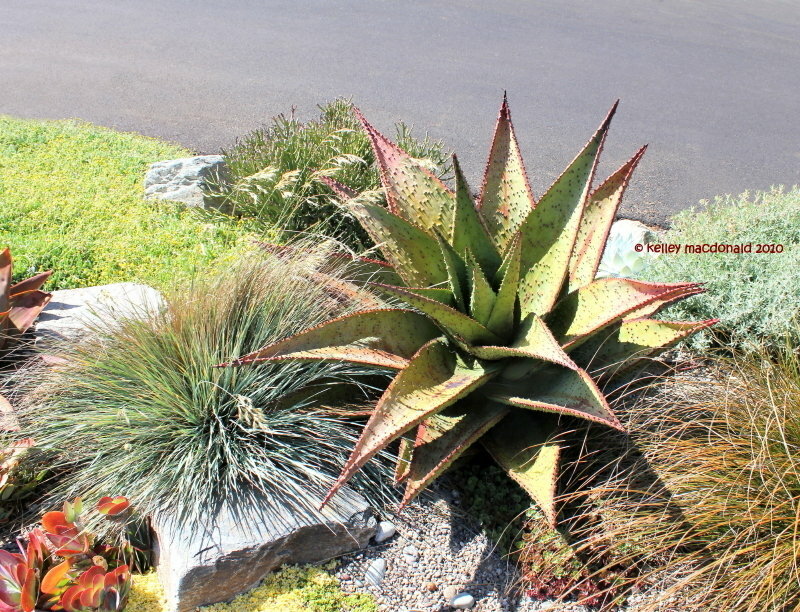 This one recieves more water than one in another part of the yard and it looks much more plump and beefy. 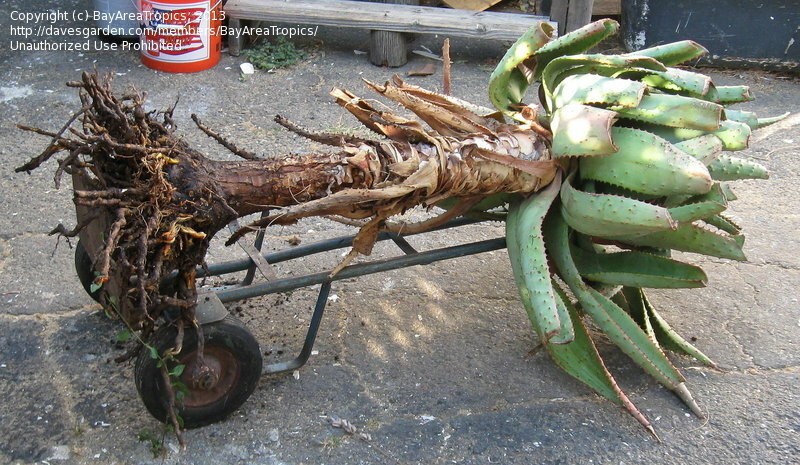 this one rotted summer 2008 after getting 15 inches of rain in 2 days. 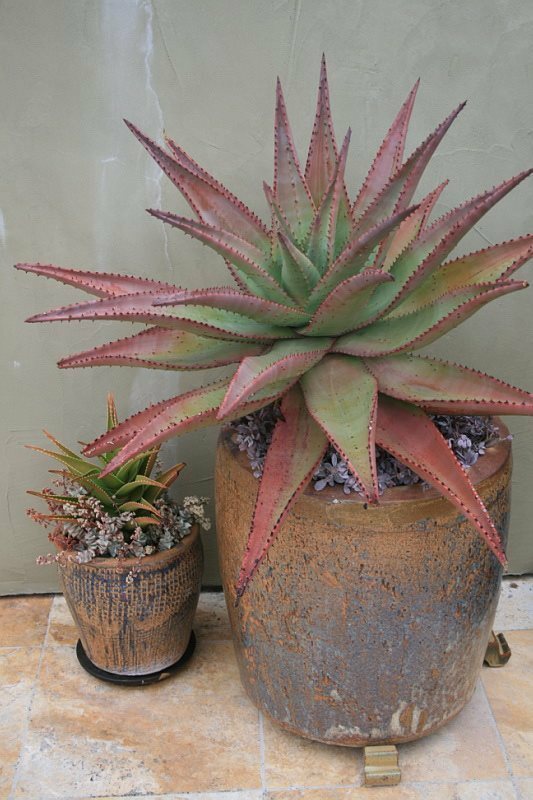 Dont plant in the ground where it can stay wet, I plant these in pots only now. 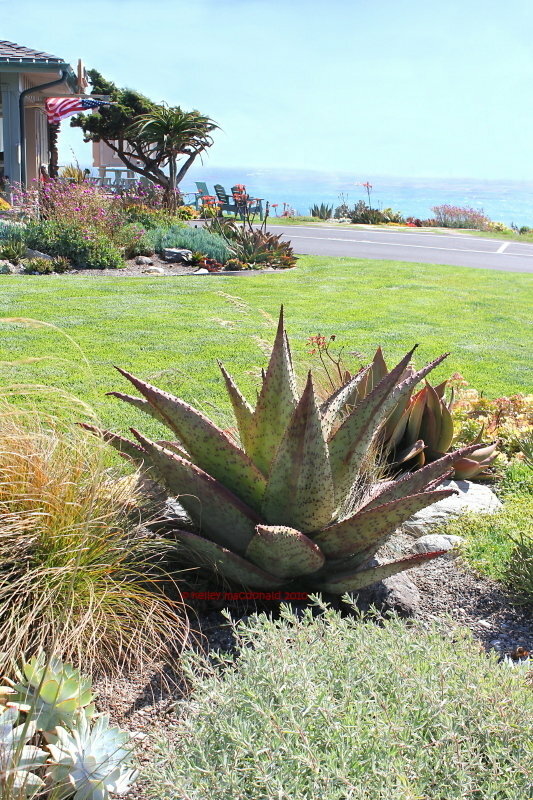 In a seaside garden designed by Nick Wilkinson of Grow Nursery in Cambria, California. 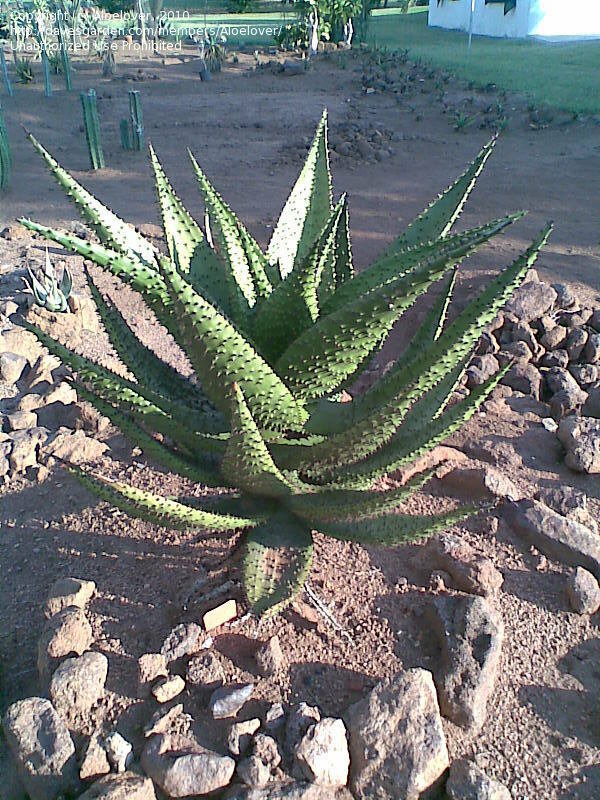 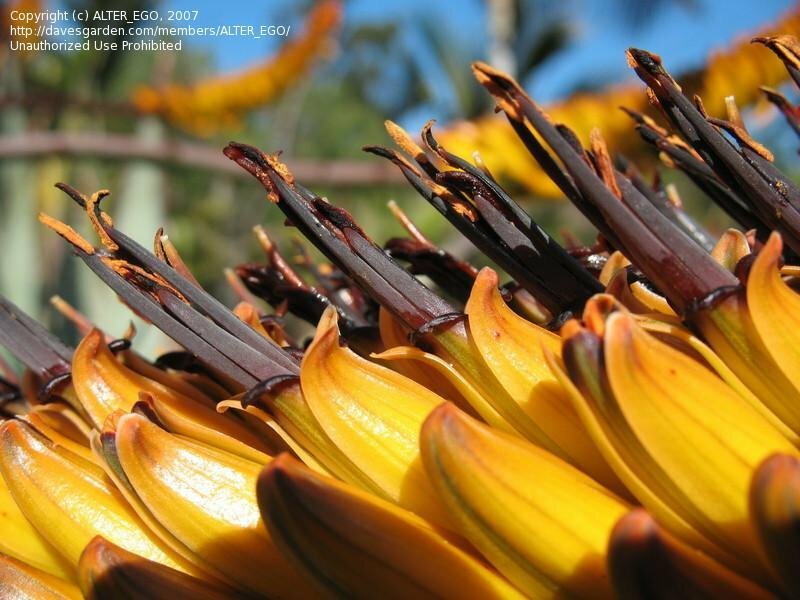 This was grown from seed obtained from Pench, in the Limpopo province. 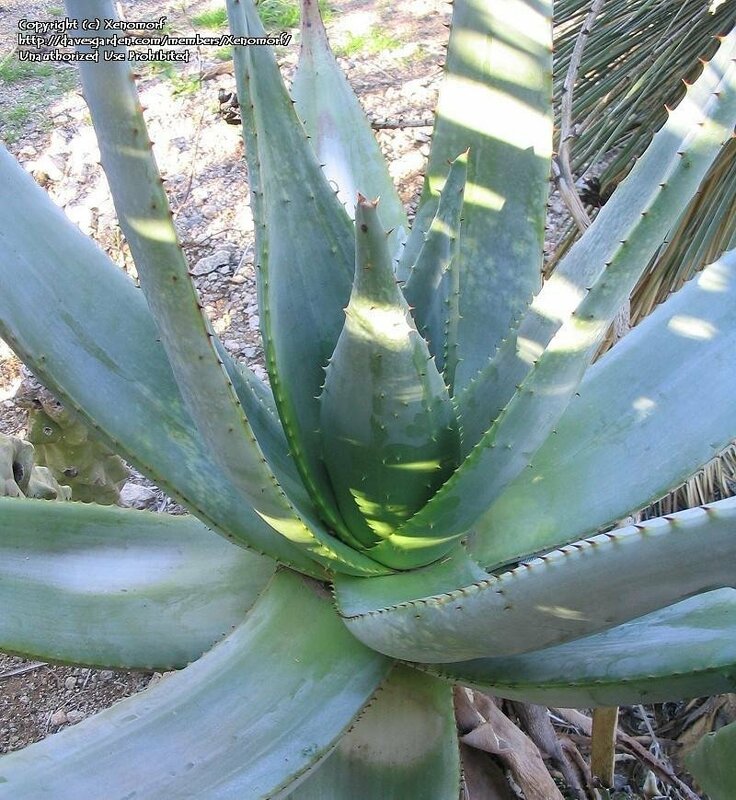 Plant is now 3 years old. 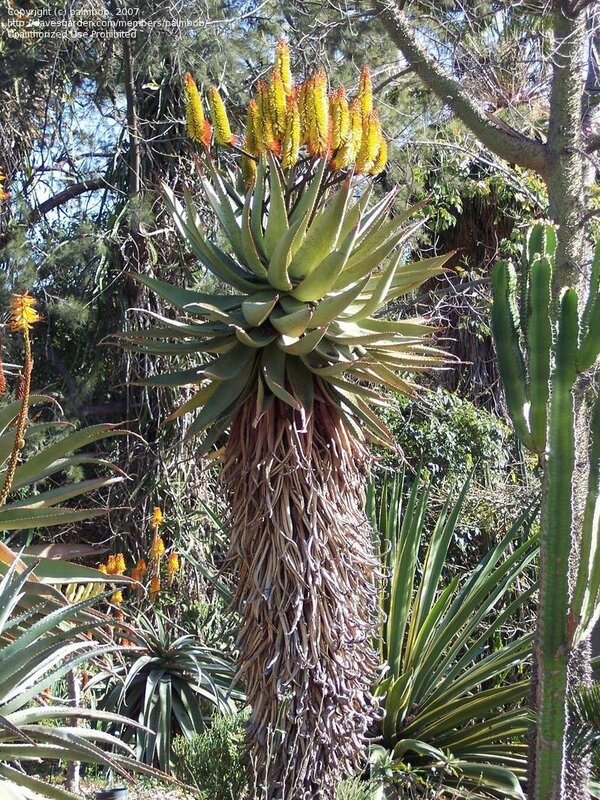 Just starting to flower on 2/3/2010. 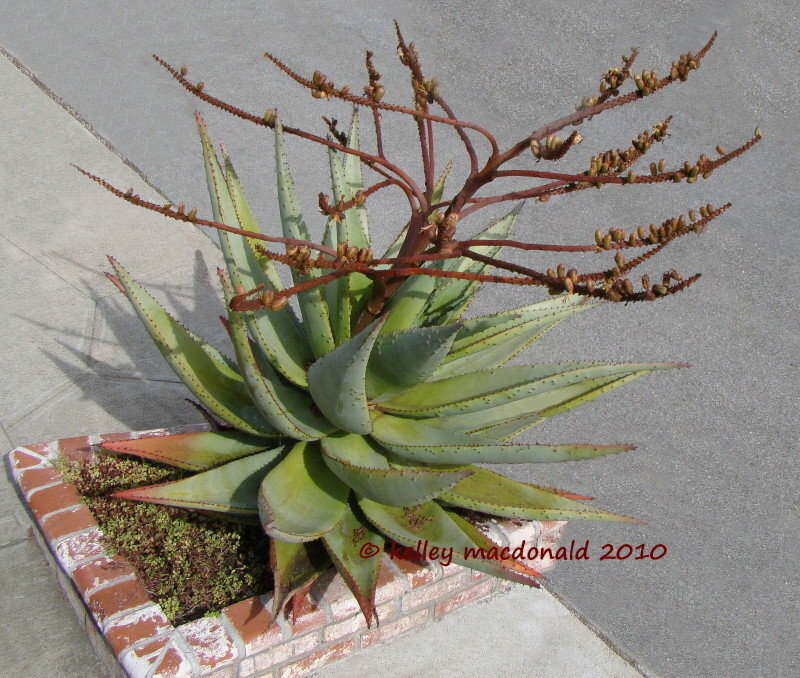 See next photo 4 months later when plant now filled with seed pods. 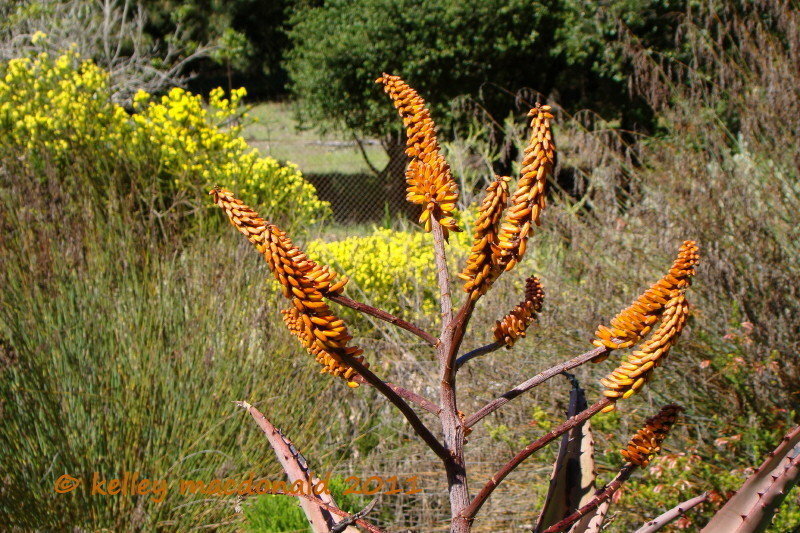 4 months later than previous photo as it starts to flower, now on 6/7/2010 full of seed pods. 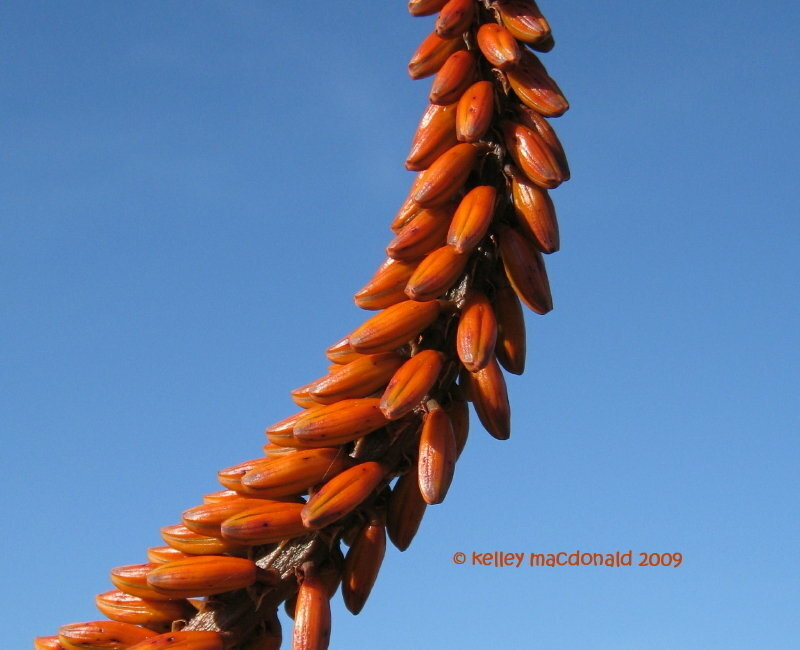 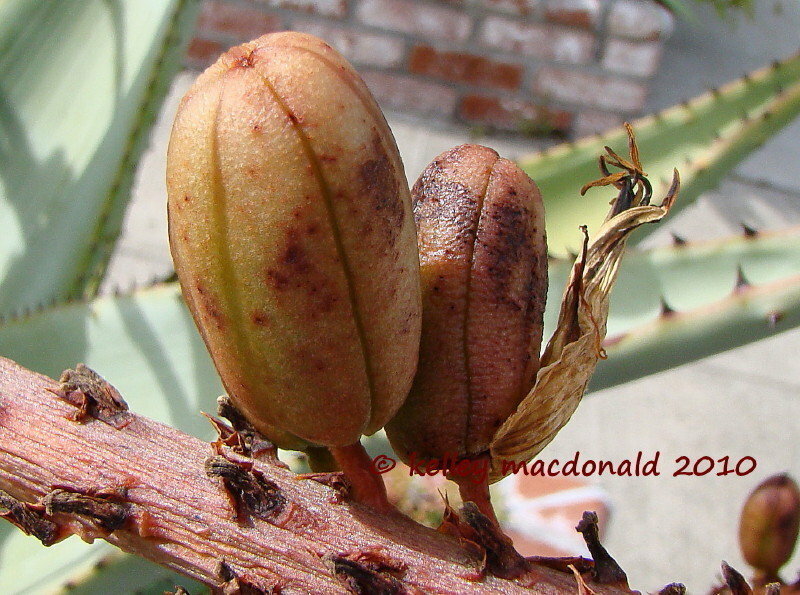 2 seed pods, see dried flower at side. 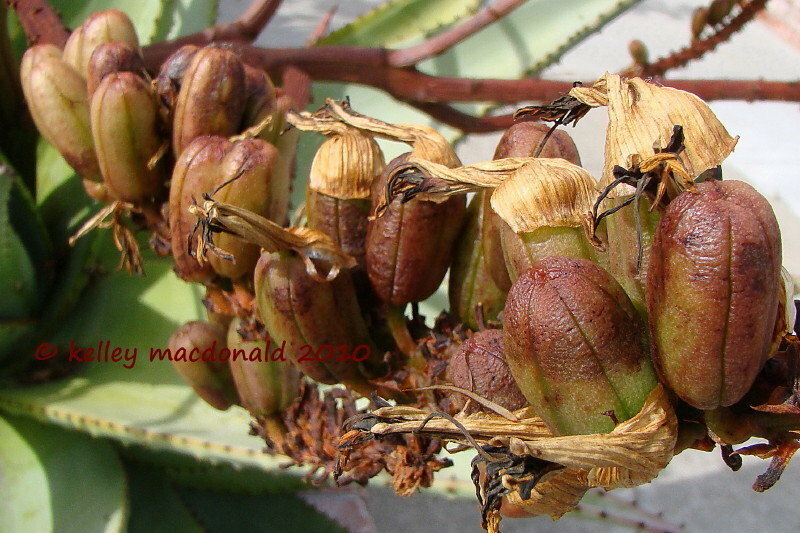 Seed pods with dried flowers still attached. 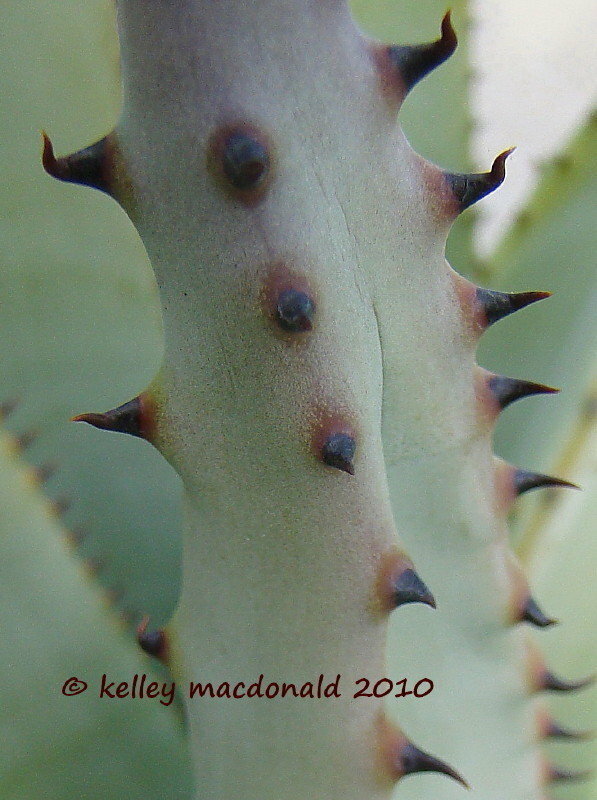 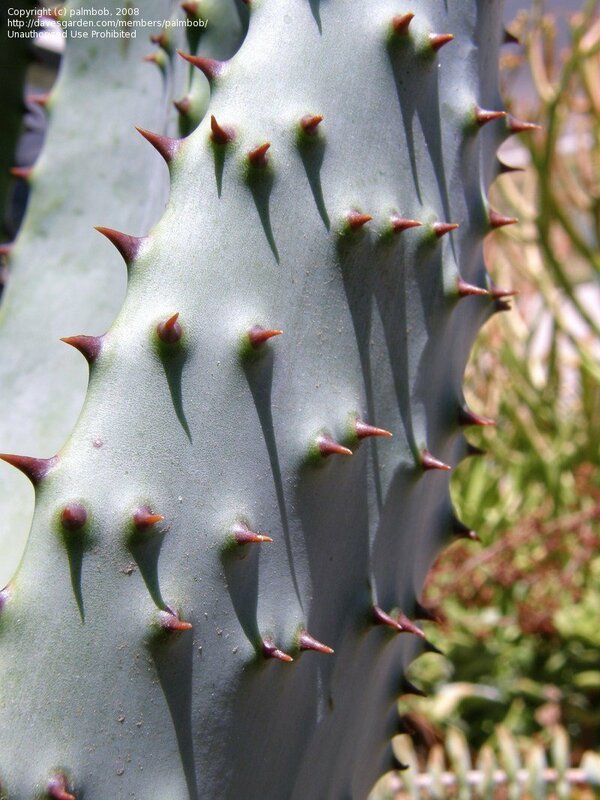 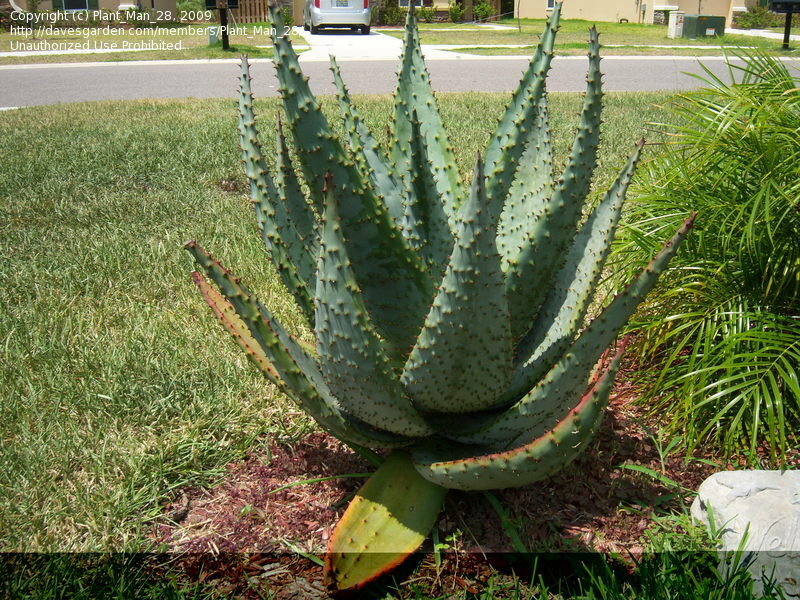 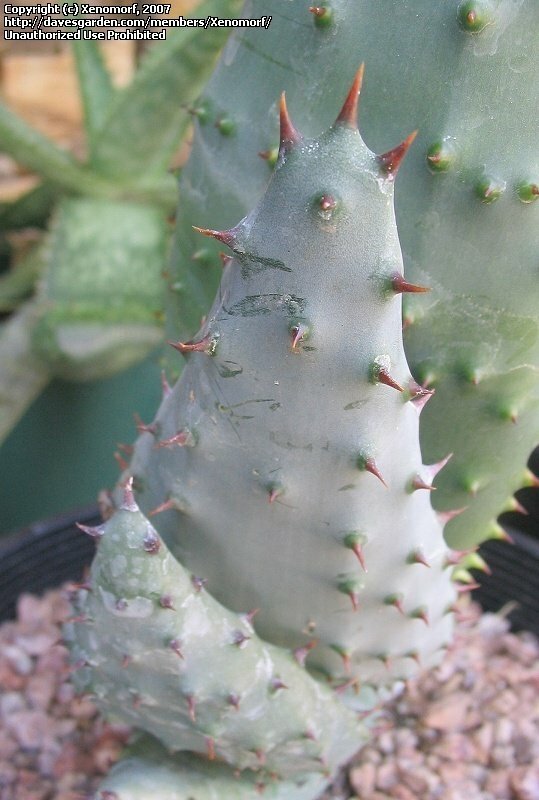 Look at the under leaf spines! 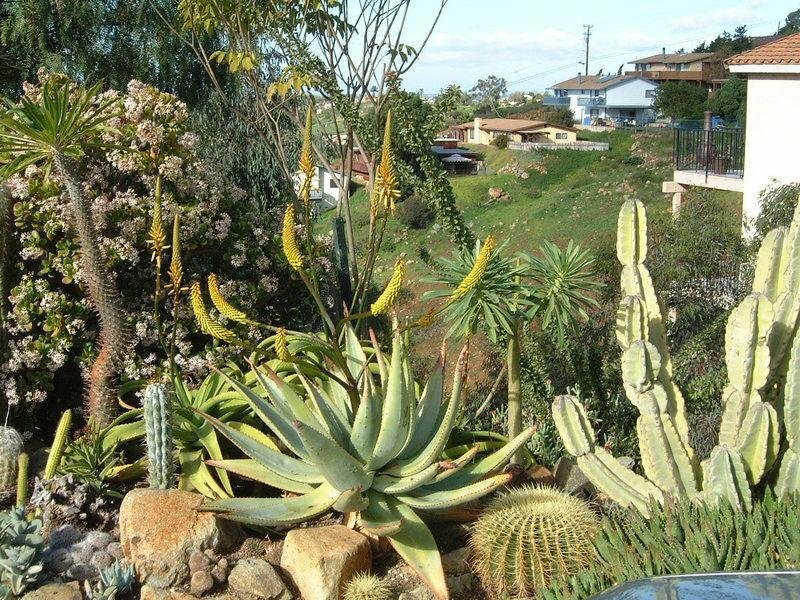 2 of them in this photo. 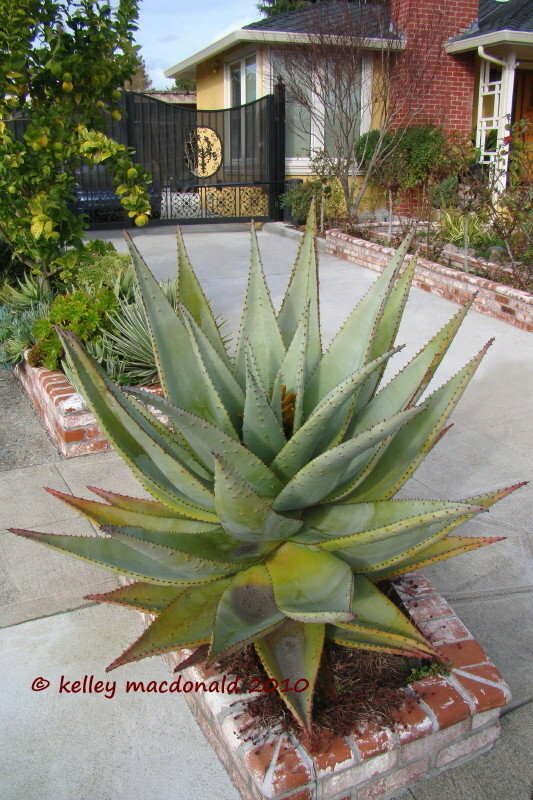 Outgrew the curb. 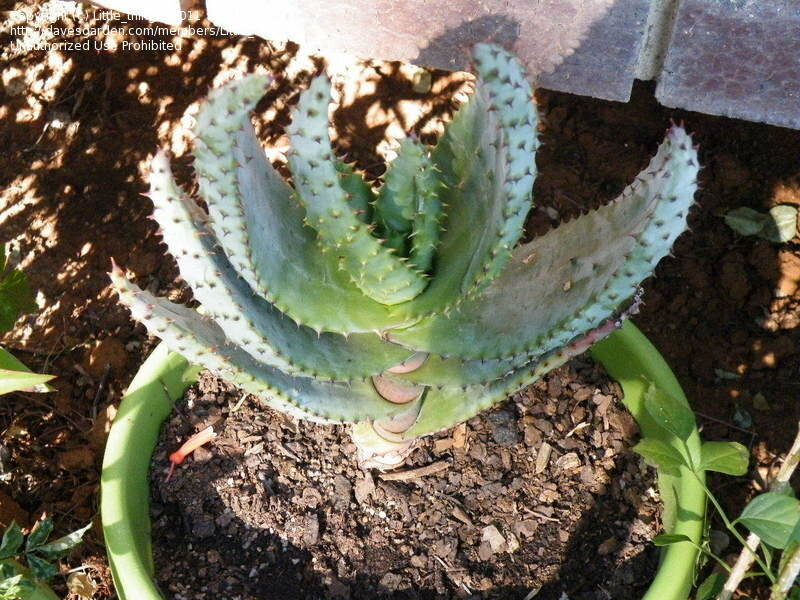 Replanted elsewhere and happy. 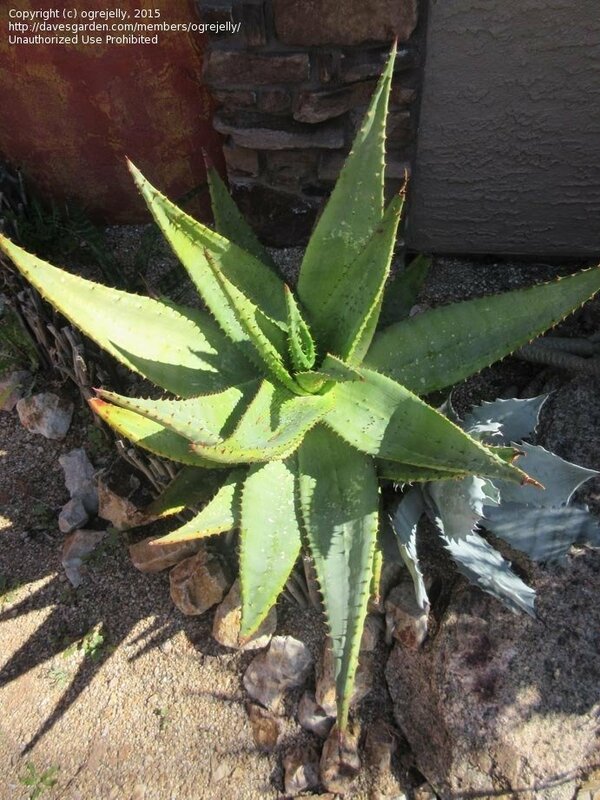 This Mountain Aloe is growing on the west (dry) side of Tucson in the Tucson basin about a quarter mile from the base of the Tucson Mountains. 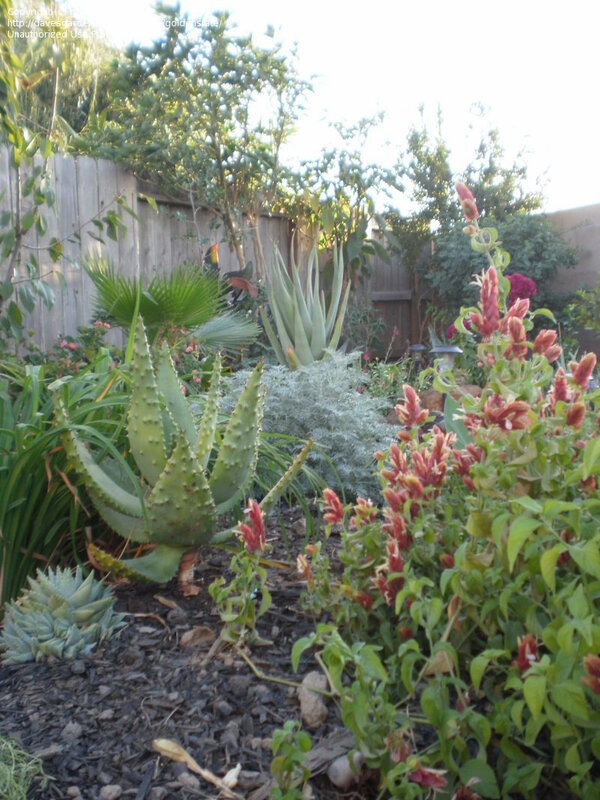 The basin soil tends to be well drained. 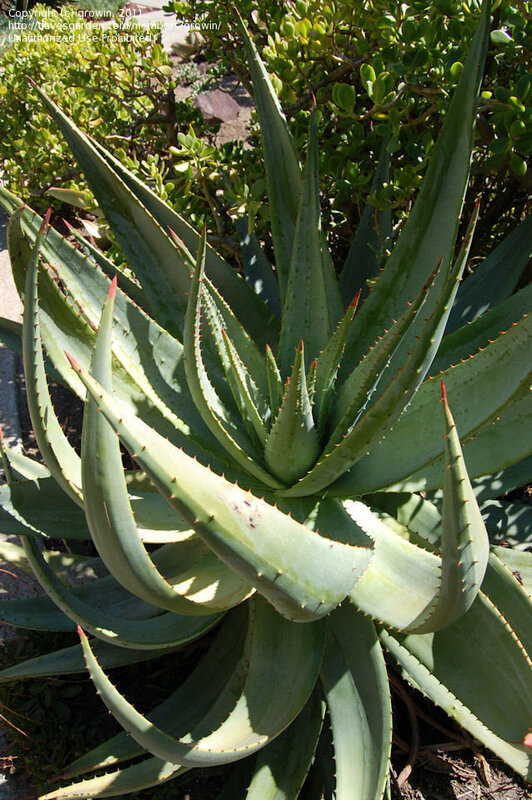 Nice hard grown one at UC Berkeley. 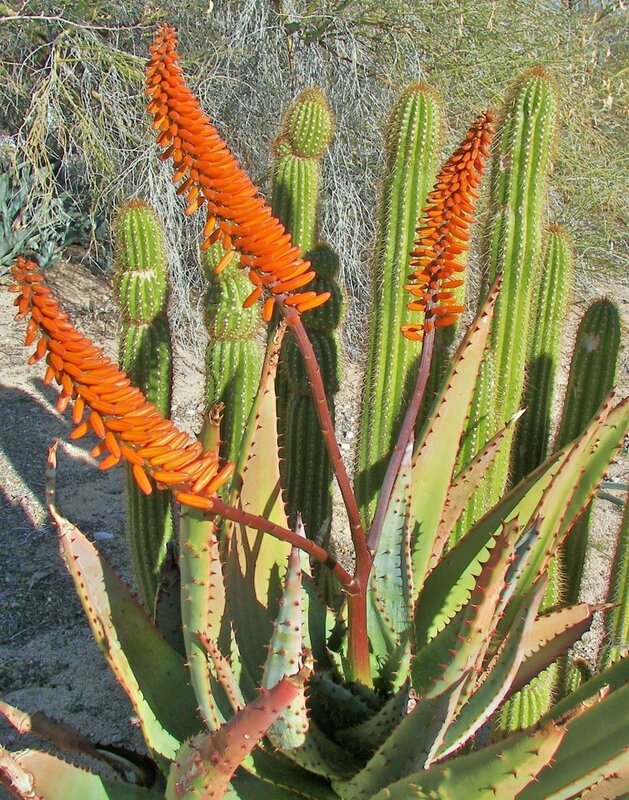 Photo courtesy of; copyright of Jan Emming of Destination:Forever Ranch and Gardens, a 40 acre desert botanical garden/sustainable living homestead in AZ. 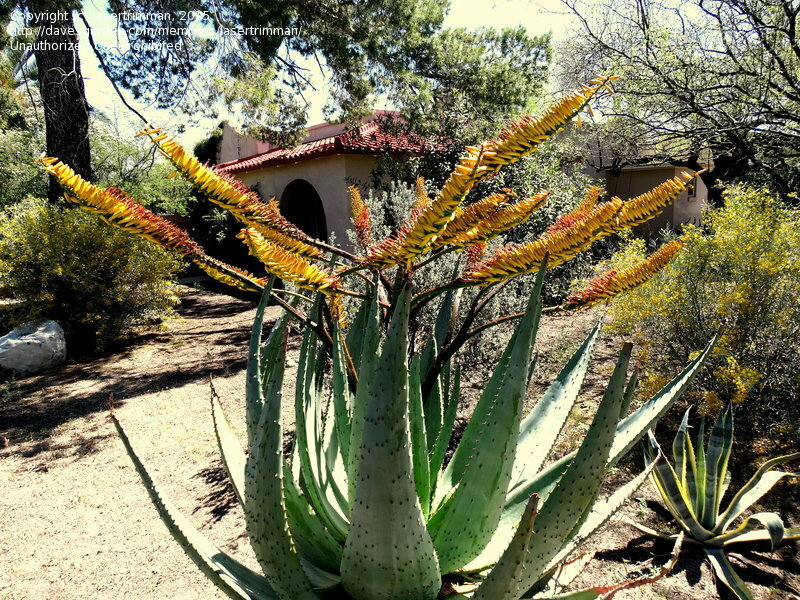 Photo courtesy/copyright of Jan Emming, Destination:Forever Ranch and Gardens, a 40 acre desert botanical garden/sustainable living homestead, AZ.